Not surprisingly, I inherited a love for old and quirky cars. My father John P. encouraged this with patient technical support and teaching. There weren’t (and aren’t) too many automotive ills a visit to the farm shop in Indiana can’t cure. 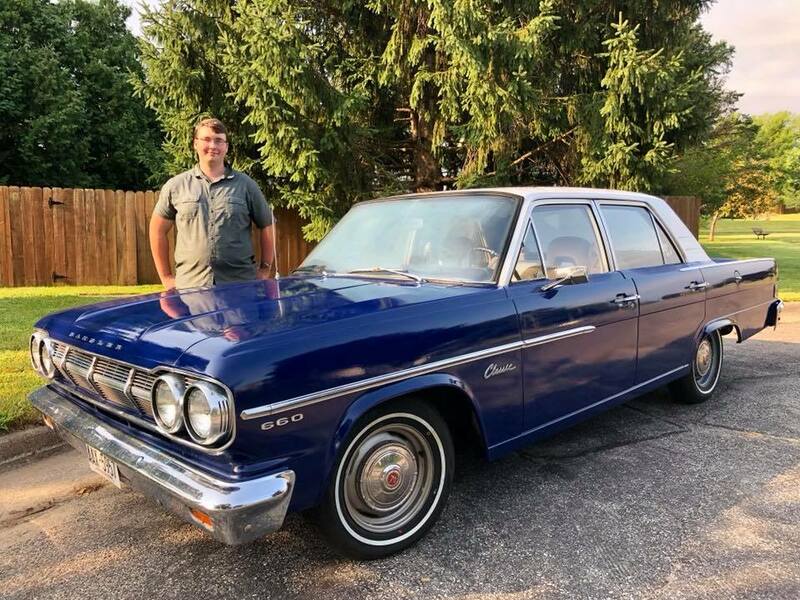 In honor of my grandfather and father, this is my “auto” biography: a relatively complete list of cars I’ve owned or spent quality time with, ordered according to when I made their acquaintance, with some brief thoughts about each and occasional links to a little something extra. 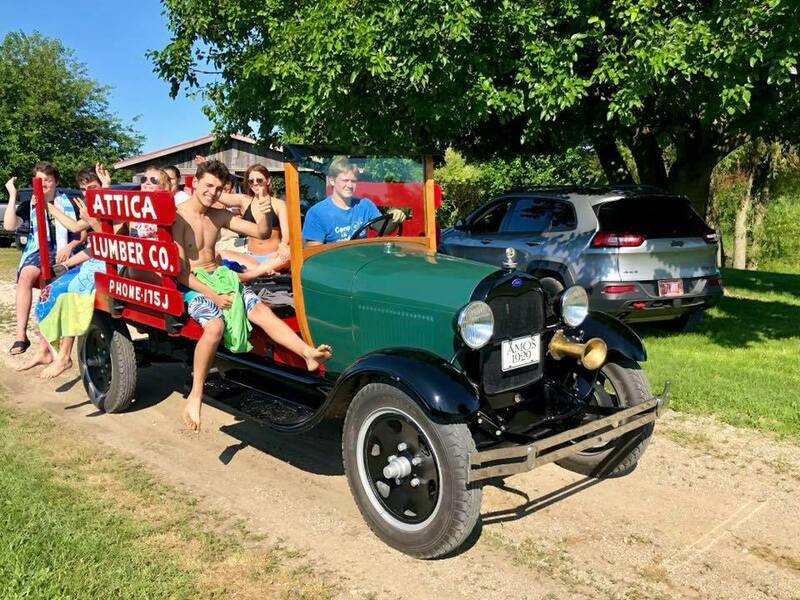 1929 Ford AA lumber truck (“Amos”) – A family vehicle purchased by Grandpa Delmar Martin in 1929 when he took over the Attica Lumber Company. Delmar bought a bare chassis and built the flatbed and windshield using lumber, plate glass, and other parts around the yard. Amos served for 30+ years making deliveries, shoving railroad box cars along the siding, and appearing in local parades and high school events. 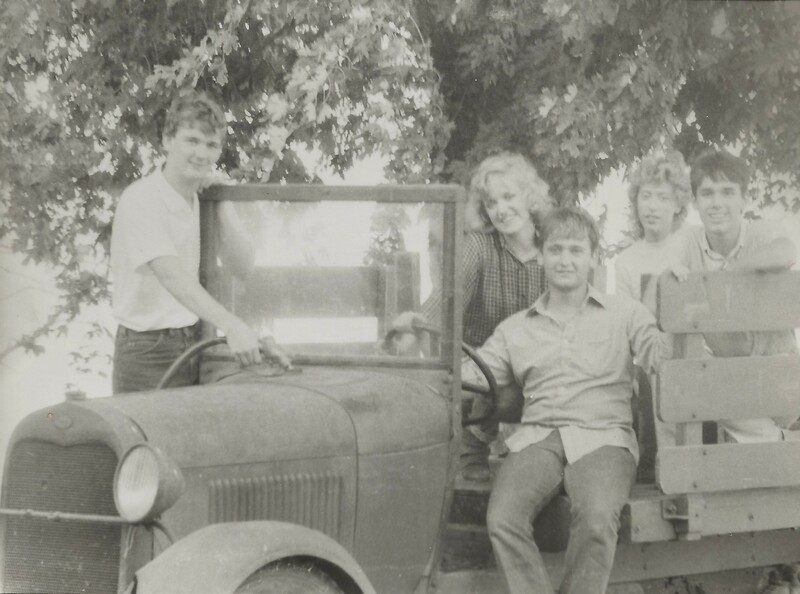 When Delmar closed the lumber yard, Grandpa H. Park Hunter purchased Amos at the sale and used it lightly around the farm. In my youth, Amos mostly sat idle at the back of various barns and sheds, sometimes for years at a time. When I was in high school, I learned some of my first mechanical skills getting Amos running again for family reunions and high school parades. A few years ago, the family treated Amos to a full restoration. He still appears regularly at family gatherings every summer and has taught Delmar and H. Park’s great-grandchildren how to drive a straight shift. 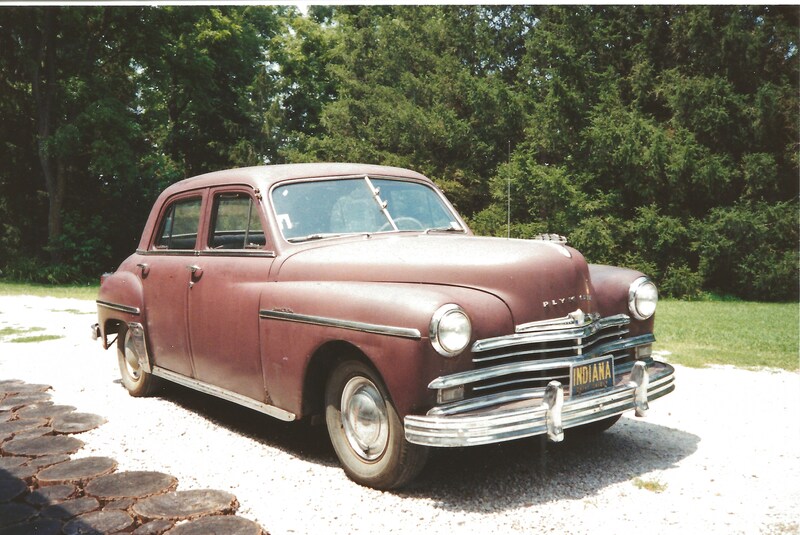 1948 Plymouth P-15 Special Deluxe (“The Hoover”) – The first car that I could really claim as “mine.” Dad helped me shop for an old car and we finally located this one, which was pretty solid inside and out and had a “newer” 1954 flathead 6-cylinder. 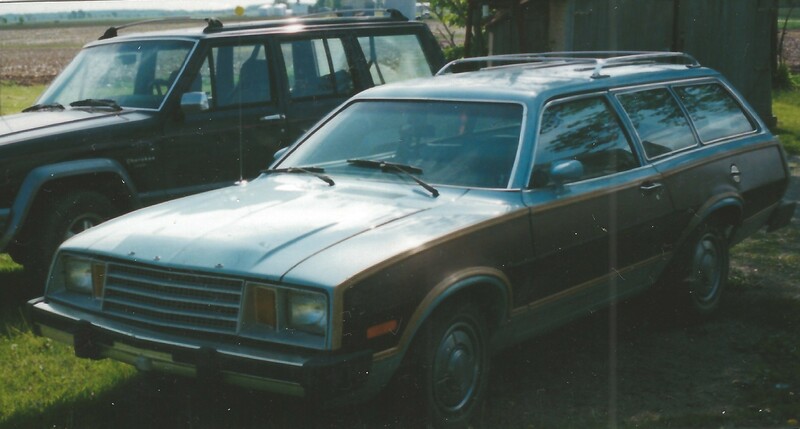 I drove this car for four years in high school and most of college. My younger brother Scott was embarrassed to be seen in it, but riding with me beat riding the bus… except when we arrived at school with the emergency brake on fire. We called it the Hoover because it made a moaning sound like a vacuum cleaner at speed. The Hoover was a very reliable car that I drove year-round. I coped with the vacuum wipers by coating the windshield with Rain-X. I coped with the lackluster heater by wearing coat, boots, etc. in the car and carrying an ice scraper to clear the windows. I had many, many adventures in the Hoover. In high school, the ammeter melted on the way to a movie in Danville, IL. We were close to the theatre, so Doug, Beth, and I pushed it through the intersection while Kristi steered. 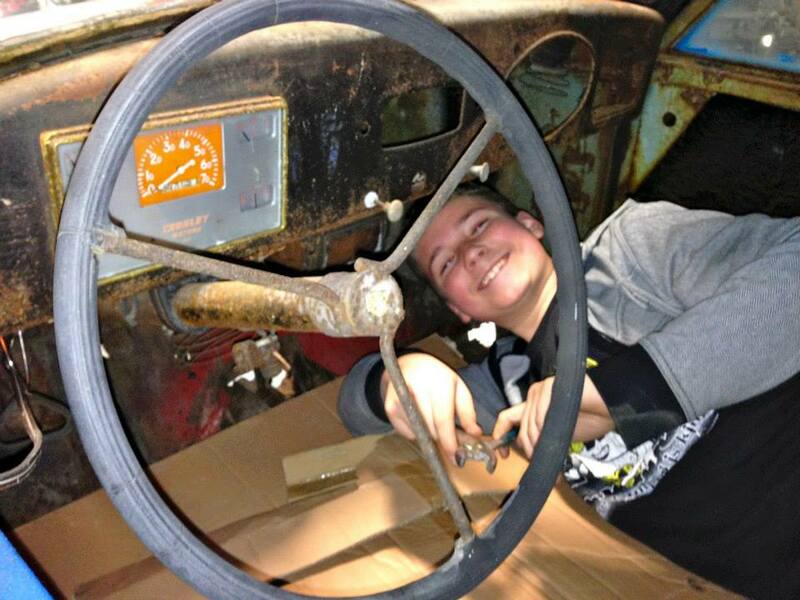 My dad came and fixed the car while we were in the movie. Another time I was on my way to the senior prom and didn’t realize I had a headlight out. The deputy who saw me knew who I was, so instead of pulling me over he called my folks. Once again, Dad came and changed the headlight while I was at the dance. In college, I was the bootlegger for a frat party (I’m a teetotaler) and got lost on the way to the dance with all the alcohol in my trunk. I even lapped the Indianapolis Motor Speedway in this car during a national car show. The Hoover stayed in the family barn for years, and came out once in a while when I needed a backup car for the next decade. Baby Anna got to ride in it. 1987 Thunderbird Turbo Coupe – After several years with the Hoover as my main car, Dad upgraded me to this silver 5-speed Turbo Coupe in 1990. How exciting to have reliable heat and air conditioning! Few remember how advanced the Thunderbirds were at the time, with antilock brakes, a slippery aerodynamic shape, and an intercooled turbocharger. A quick car for the era, with 0-60 in 7 or 8 seconds and a top speed of 143mph (so I’m told). One of the most comfortable cars I’ve ever owned, capable of long highway cruising. If I kept my foot out of the gas, it could achieve 30+ mpg on the highway. If I kept my foot in the gas, it averaged 17 mpg. Old friend Doug Taylor and I took the ‘Bird to visit my great grandmother Crone in Fort Myers Beach. We felt pretty clever for our bargain Florida spring break… until Great Grandma banged on the floor at 6:00am to wake us up for breakfast. We took her out for dinner in my pride-and-joy Thunderbird. 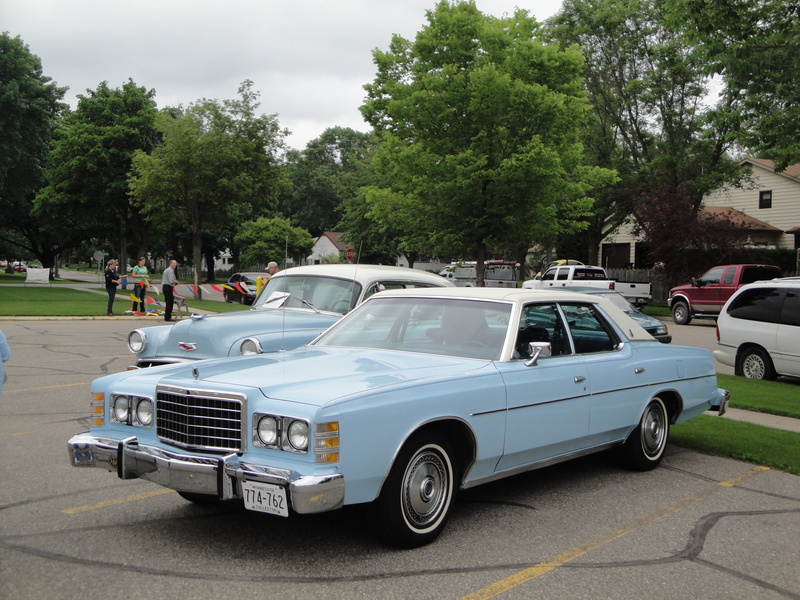 She had two comments: “Pretty car,” and after five minutes in the back seat, “Doesn’t ride like a Cadillac.” I had two accidents and earned my first speeding ticket in the Thunderbird, after driving the Hoover for four years with a perfect record. 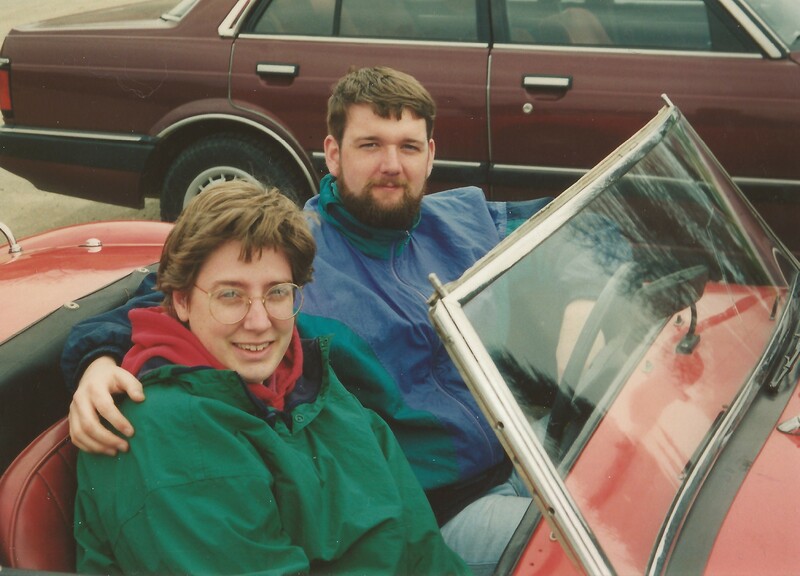 I also took the woman who would become my wife on several long road trips during and after college, including one where the fuel pump died and we were stranded taking her back to the airport. 1939 Plymouth Roadking – Part of a cheap two-for-the-price-of-one deal with ’49 Plymouth #1. I bought both for $1000 to “flip,” or resell. They ran! The ’39 had no brakes and a ratty interior, but was a solid car with beautiful styling. Roadking was the lower model in Plymouth’s lineup in 1939, so instead of a column shift it had a floor shift. If I hadn’t been in college at the time, this would have been a good car to restore. I took it to the national Plymouth Show at the Indianapolis Motor Speedway and eventually sold it. 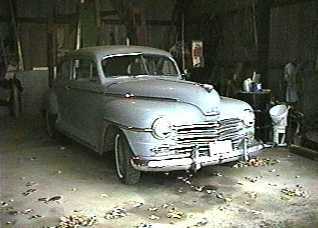 1949 Plymouth P-19 Special Deluxe #1 – The other half of the twofer deal, this car was a driver. The body was faded and rusty enough that it had moss growing in places, and the 6-cylinder had a knock that boded bad things in the future. But I fell in love with the elegant woodgrain dashboard and its symmetrical round gauges, and the one-year only fluted bumpers. With a lot of elbow work and scrubbing, the filthy dirt- and cat-barf covered seats looked like new, too! (Mohair upholstery was good stuff.) I eventually sold and delivered the car to a guy who owned one of the Wagonall Family Truckster movie cars from National Lampoon’s Family Vacation, complete with grandma strapped to the roof. 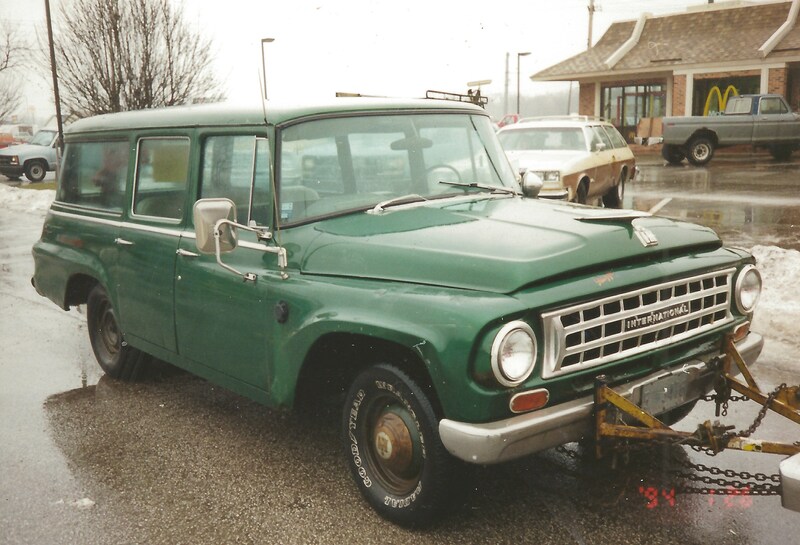 1964 International Travelall (“Harvey”) – Co-owned with my brother Scott. We dreamed of road tripping up the Alaskan highway, and thought we should find a cheap but tough vehicle for the trip, which we could sell in Alaska and fly home. Harvey was advertised as “$10,000, but I will deep discount at least 95%. 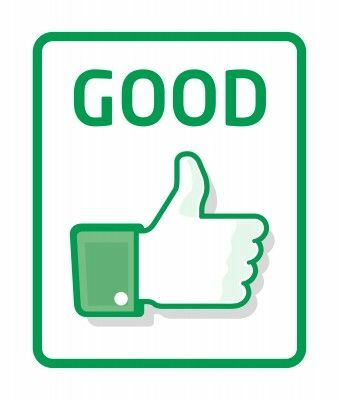 This truck has good karma and has been a reliable starter.” We paid $450. Harvey did indeed start and run well… until five miles after we bought him, when he blew a radiator hose and coasted to a stop beside the highway. Over the next year we spent another $500 trying to make him reliable before giving up. I never had any trouble with Harvey, but for Scott he caught on fire, died, or often refused to start. 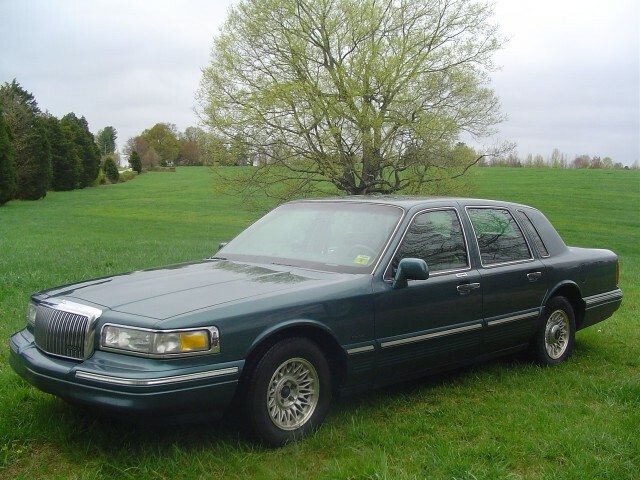 We eventually borrowed my folks’ Mercury Grand Marquis and road-tripped to California. I drove Harvey quite a lot, enjoying the 304 V-8’s deep torque and the 4-speed transmission’s solid mechanical feel. Harvey was great for hauling stuff. But there was no heater, and it always smelled a bit like exhaust. I faked a breakdown once in order to propose to my wife. Her response: “Are you serious?” (She eventually said “yes.”) We finally sold the truck to a guy in Kentucky for almost the same amount of money we put into it. That’s a whole ‘nother story. 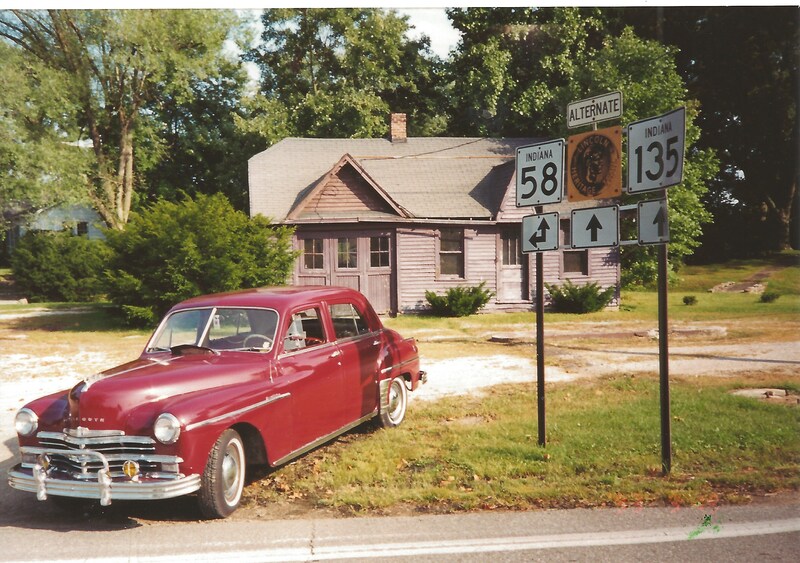 1949 Plymouth P-19 Special Deluxe #2 – Out of college, I went to work for the Indiana Academy in Muncie as a residential counselor. I had disposable income and wanted an old car to enjoy. 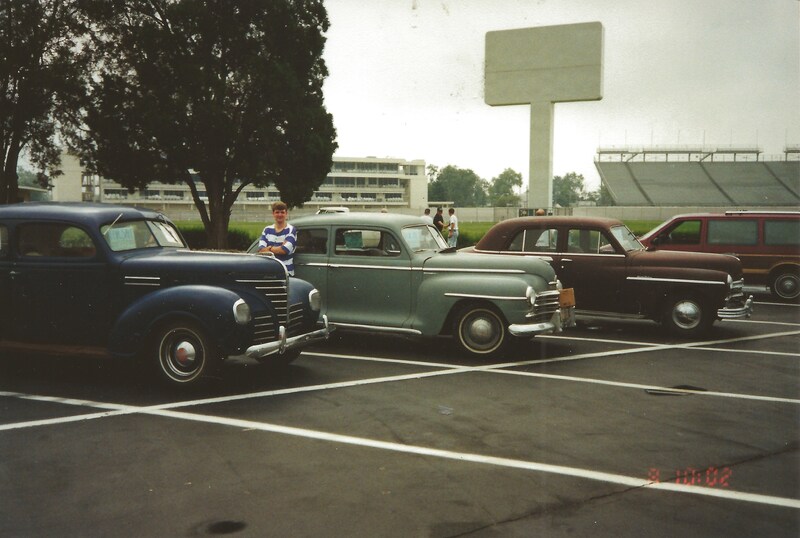 I saw this nice, 26,000-mile original Plymouth in the want ads and remembered how much I liked the ratty ’49 I used to own, so a friend and I went to Indianapolis to buy it. I learned an important lesson on the way home. The car had been sitting mostly idle for years, and the oil had broken down into sludgy globules that didn’t show up on the dipstick. While cruising along the interstate at 60mph, one of these globs plugged an oil passage and the engine spun a rod bearing. Friend Kelly said she had never seen me make such a sad face. I towed it home and immediately had to invest in an engine rebuild. The $1,000 lesson: I should have changed the oil before driving it a long distance! 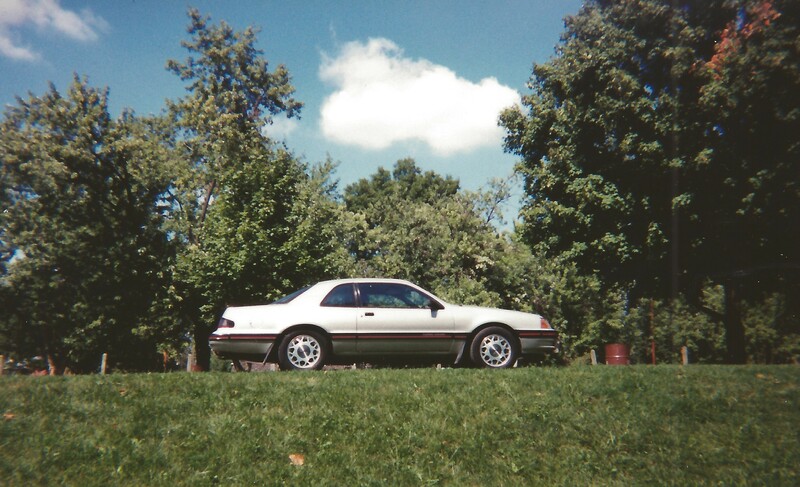 I did enjoy this car for a few years, driving it all around Indiana and camping at state parks. 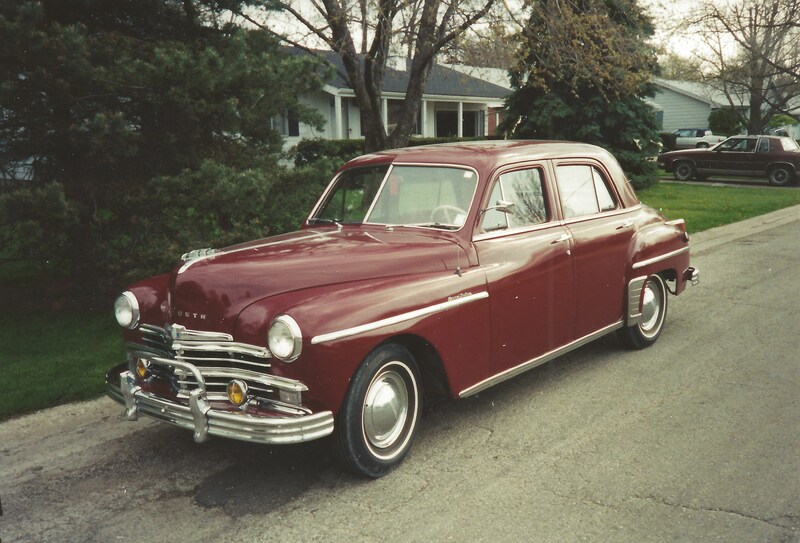 On formal dance nights at the Indiana Academy, I was a popular chauffeur in the fancy-looking Plymouth. This car often won awards at car shows for its nice original condition. And oh, those fluted bumpers! 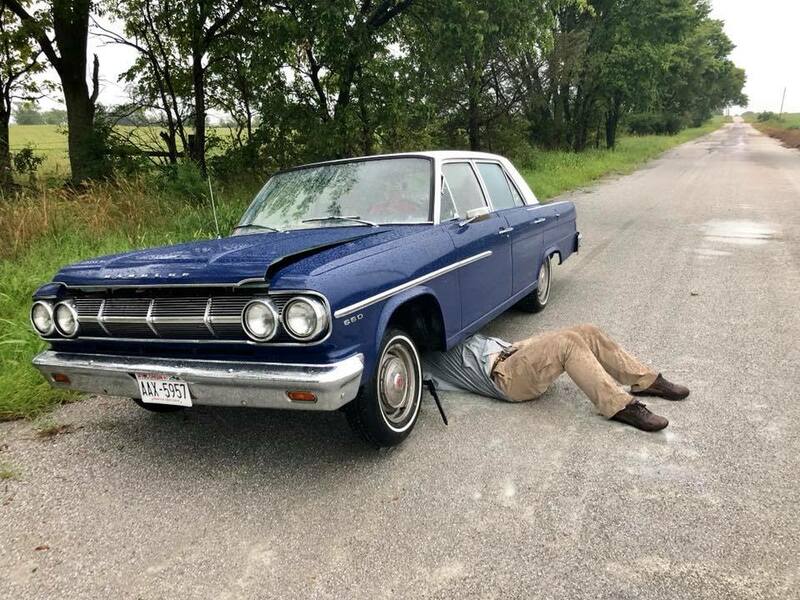 1960 Rambler Six Super Cross Country – When my Thunderbird stranded me (dud fuel pump) taking my fiancé back to the airport, the garage where the ‘Bird was towed had this sitting out front for $800. I’d never heard of Ramblers, but I liked the look. Since it was going to take a few days to fix the Thunderbird, I took a cash advance against my bank card, bought the Rambler and drove it home. This became my daily driver for a few years, and one of the finest cars I’ve owned. It didn’t like cruising at interstate speeds, but it was roomy, comfortable, could haul a ton of stuff or people, and had great heat. When I worked at a residential high school in Muncie, Indiana, it wasn’t uncommon to stuff ten kids in the car and drive to Ivanhoe’s for ice cream. 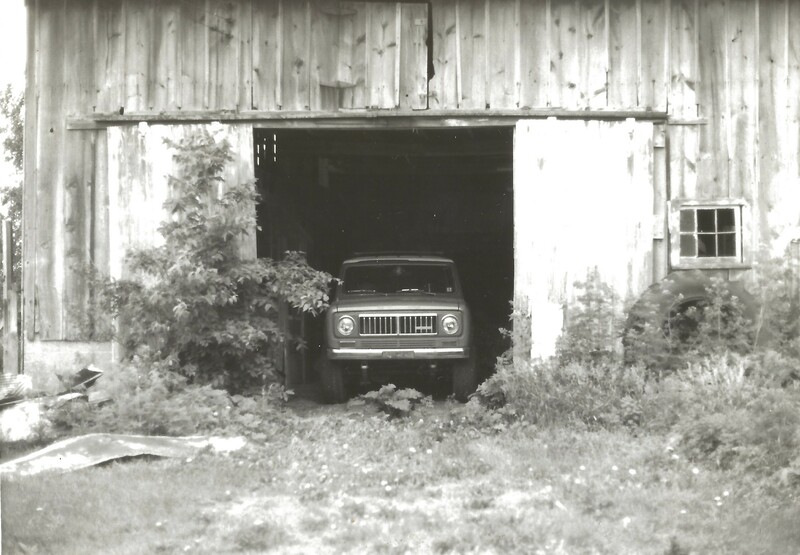 I drove this to California, took it on my honeymoon to Door County, and moved it to New Jersey where I drove all over the East Coast in my job as an antique auto journalist. 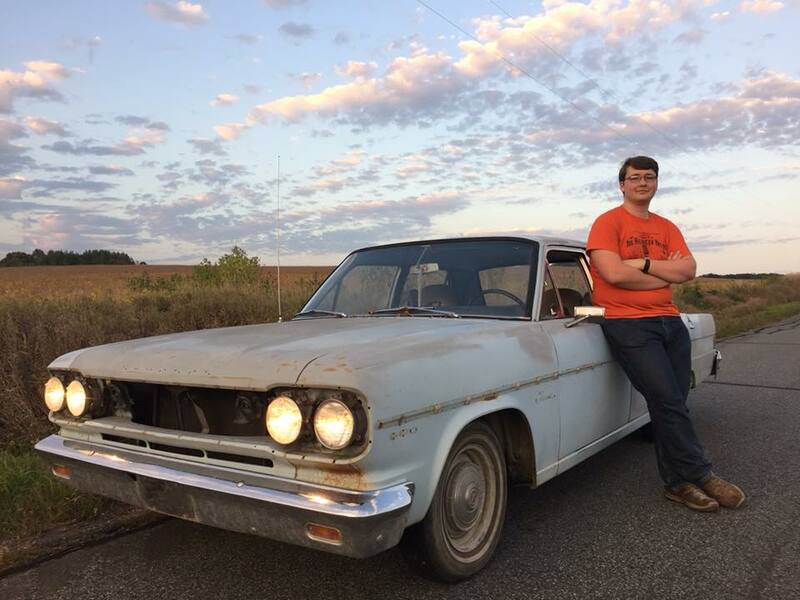 The Rambler cruised all day long at 20mpg and 55mph. The most common question I got while driving it came from folks who were teenagers back in the day: does it have those seats that fold down into beds? Mine did not. I eventually traded it for the Dart because it couldn’t keep up with crazy New Jersey traffic. I wish I had back! 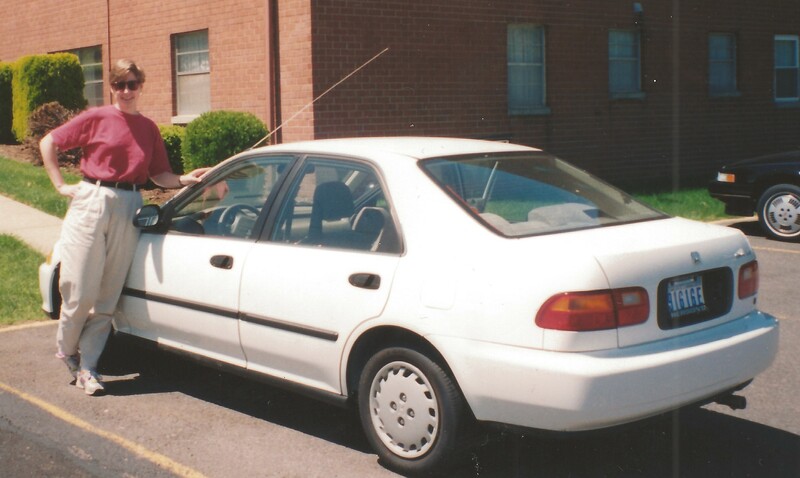 1994 Honda Civic (“Fred”) – Anna-Lisa bought this car new in graduate school. It was her pride and joy while we were dating. Very practical too: when she got an apartment, she was able to buy all her furniture at IKEA, fold down the rear seats and load everything in Fred, and assemble it herself at home. I hit a deer with Fred, bending the hood in an expensive manner, but Anna-Lisa still married me. Fred the Honda moved with Anna-Lisa from Maryland to DC to New Jersey, and then moved again to Indiana early in our married life. 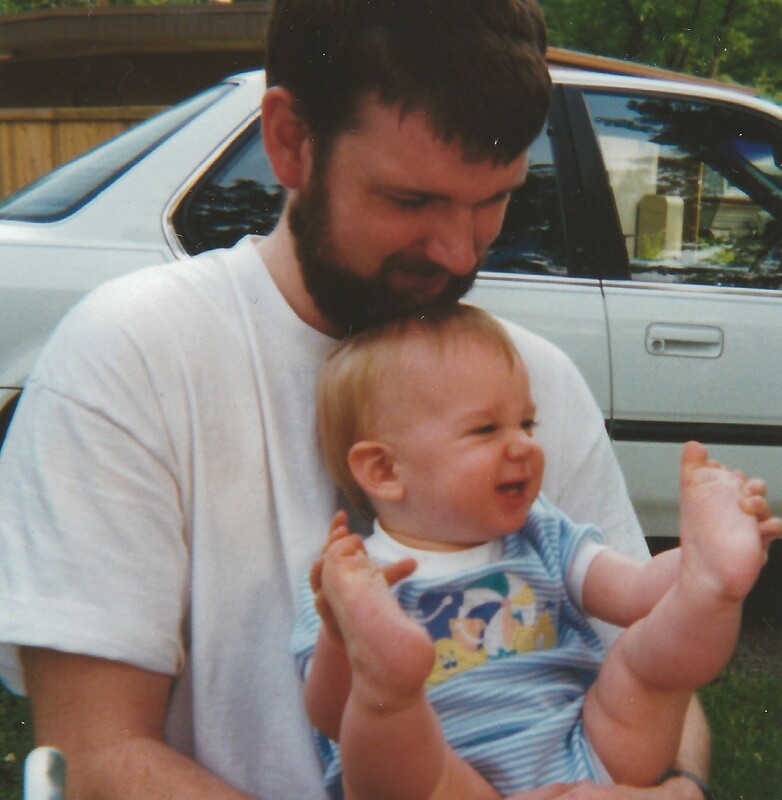 In 1996, our newborn daughter Anna came home from the Indianapolis hospital in the backseat of Fred. Because we were newbie parents, we had Anna bundled up with blankets and a stocking cap. Fred’s air conditioning was out, and baby Anna sweated off almost a pound in the June heat! Fred finally got traded on a Jeep when we found the back seat too crowded for baby, car seat, diaper bag, etc. etc. 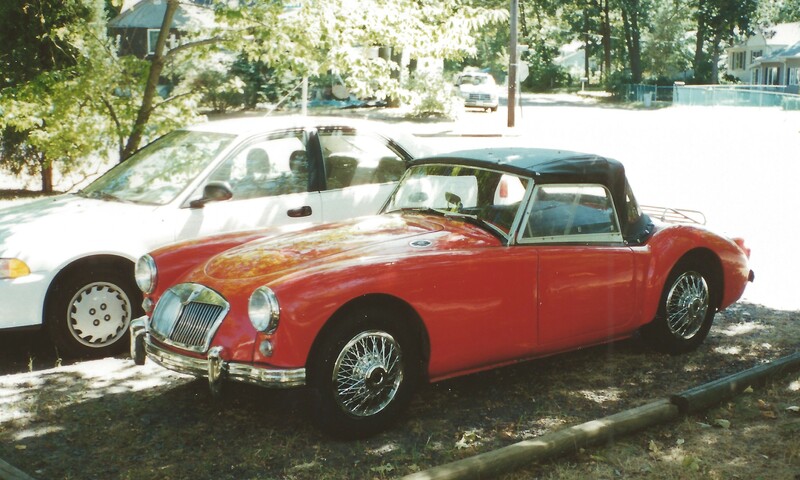 1960 MGA roadster – When Anna-Lisa and I were engaged and I knew I was moving to New Jersey, where we would not have a garage, I sold my nice ’49 Plymouth #2. But then this MGA popped up in a local ad, and the price was too good to ignore. The MGA had a very nice body and a transplanted drivetrain from a later MGB. 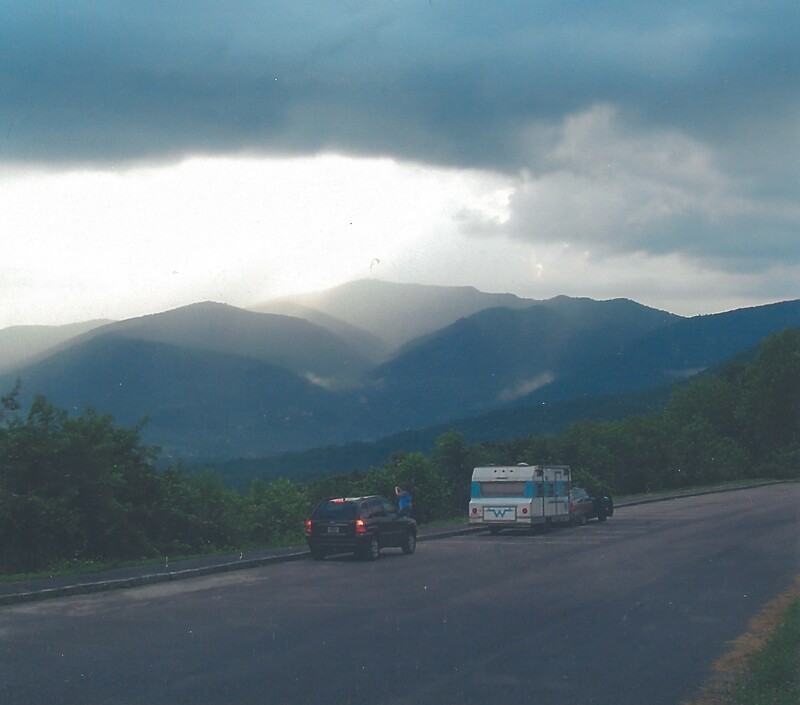 It looked good and was a delight to drive… for a few hundred miles at a time. I subjected Anna-Lisa to some long, cold drives with the top down because I thought it was cool. Years later she told me my “armstrong heater” was not enough. All the usual stuff you hear about MG’s applied – it leaked in the rain, and the electric system was dodgy. Every few hundred miles the points would carbon up and the car wouldn’t idle well until I filed them. I drove this from Indiana to New Jersey just before my wedding, achieving my goal of getting within 100 miles of my fiance’s home so I could have AAA tow it the rest of the way for free. The car and I arrived outside her house at 2am on a big diesel flatbed truck… beep-beep-backing into the drive. I won a prize at a car show on Sandy Hook, NJ over much nicer cars because everybody loves red convertibles. 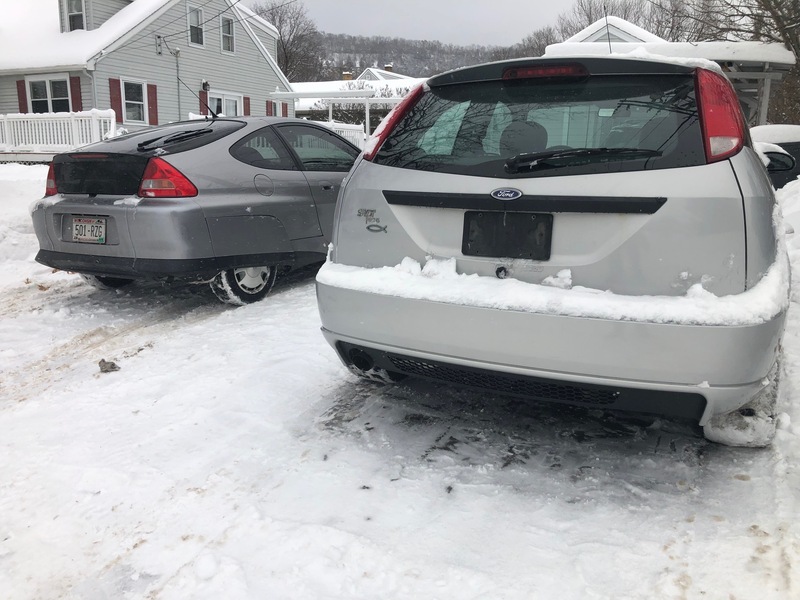 After watching the car sit under a mound of snow all winter, I sold it as an act of mercy – hoping the new owner would be able to care for it better. I’ll never be able to afford another one – MGA prices are through the roof. Owning the MGA and my 60 Rambler at the same time was probably the closest I’ll get to automotive nirvana. 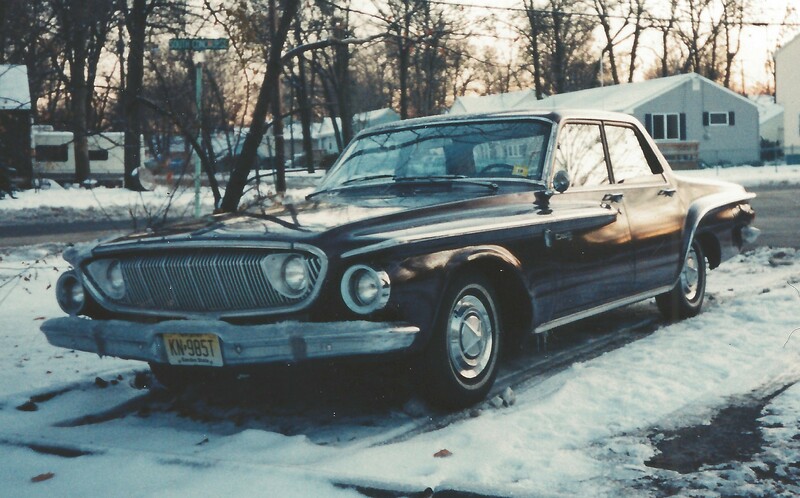 1962 Dodge Dart – My beloved 1960 Rambler wagon proved inadequate to keeping up with New Jersey traffic. I traded it for a car that seriously contends for the “ugliest car ever” award – a 1962 Dodge Dart. Mine was metal-flake poop brown, with a brown interior, a face like an unwell catfish, and complicated styling that tapered back to rocket exhaust taillights. It had a 318 V-8 with Chrysler’s famous TorqueFlite automatic, push-button controlled transmission. Looks aside, this was a reliable, pleasant-driving car that averaged around 18-20mpg. When we moved back to Indiana, the Dart made the trip. The styling had drawbacks – the sharply-raked and pointed corner of the door frame was perfect for poking me in the sternum if I was hurrying into the car. The Dart’s biggest claim to fame in my ownership? I took it to the Woodward Dream Cruise in Detroit and ended up parked next to race car driver Phil Hill’s Model T. Phil used the flat hood of my car to sign autographs. The Dart also appeared in an article I wrote for Special Interest Autos about a 1964 Chevy police car, with my brother Scott as the criminal being pulled over. When I sold the Dart, the new oner took the bus down from Canada to pick it up and drove it home. 1974 International Scout – I couldn’t bear to watch my MGA roadster sit outside in the New Jersey weather, getting buried in snowdrifts and leaking in the rain. I sold it… and then saw a really clean orange Scout for sale. I’d developed a fondness for IH V-8 torque with Harvey, and snapped up this unusually rust-free Scout with a 345 V-8 and automatic. 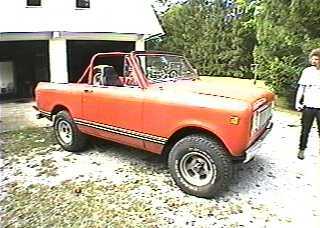 One cool feature of Scouts is that the metal hardtop can be removed, and then you have a convertible pickup truck. The Scout was snappy, but squirrely to drive on the road with its big tires grabbing every bump and yanking the truck around. This offroad beast was overkill commuting to my job at the Barnes & Noble bookstore in New Jersey… but I didn’t drive it that often. The Scout turned out to be even less reliable than the MGA, which is saying something. The big orange brute moved back to Indiana with us, and looked just right sitting in the old barn out back. 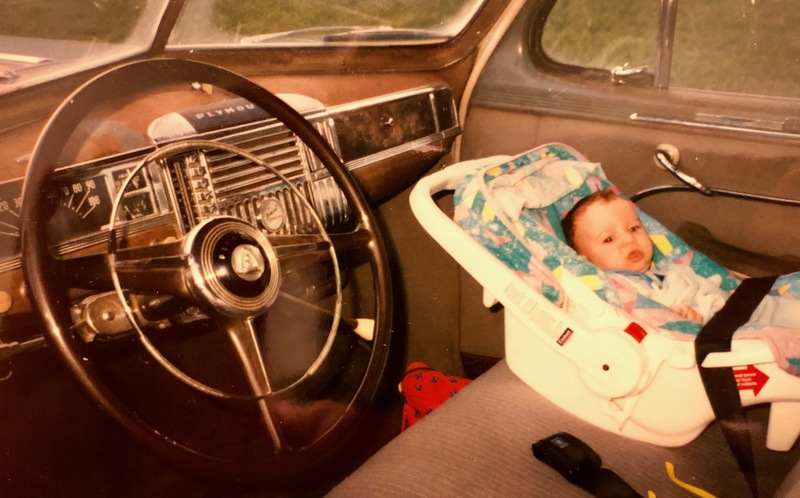 1991 Jeep Cherokee – With the birth of our daughter Anna, Anna-Lisa’s beloved Honda Civic was no longer adequate for our growing family. We traded it in on this neat black Jeep Cherokee. We learned to love this car for its sure-footed four-wheel-drive that pulled us through many a blizzard. The torquey 4.0 six-cylinder was capable of pulling our Airstream trailer over the Rocky Mountains, and crawling along sandy dunes and rustic mountain roads to ghost mining towns. 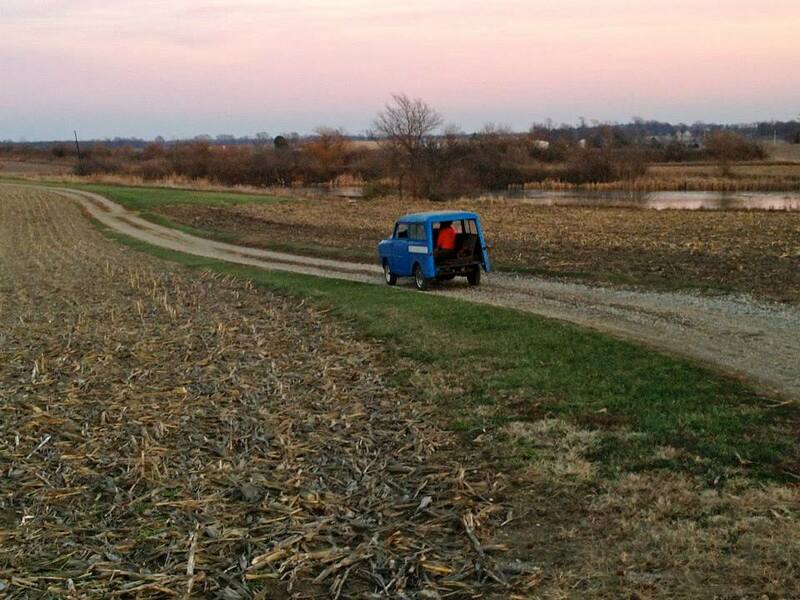 We even forded a river on a a backroad to Champaign, Illinois one time! Oddly, wen towing a load the rear brakes would sometimes cinch up and begin to drag, requiring me to get under the car and back off the star wheels just a bit. 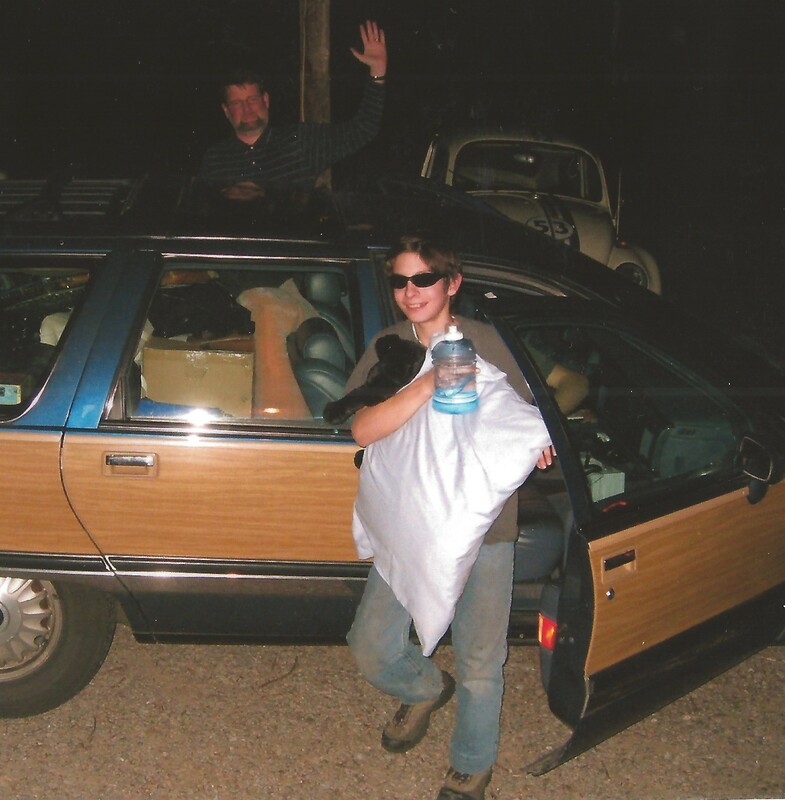 In 2000, son Erick came home from the Indianapolis Midwives’ Clinic in this car. The back seat was a little snug with car seats for Anna and Erick, and so we traded up to a larger Grand Cherokee. 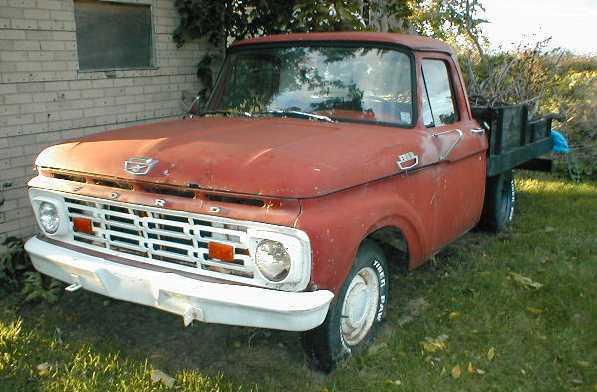 1964 Ford flatbed truck (“The Goon”) – When I sold the Scout, I still had a hankering for a truck. 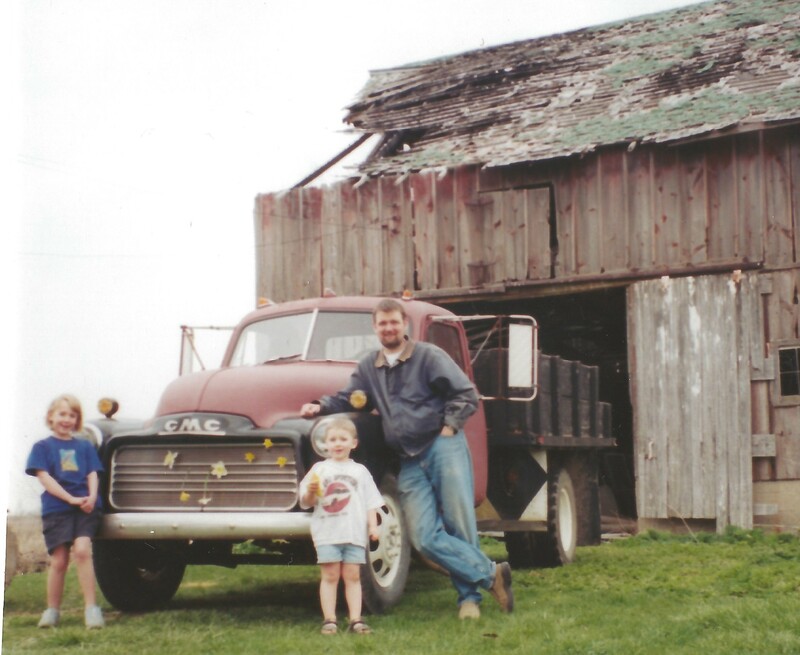 Specifically, an early ’60s Ford truck like the one I’d learned how to drive in on the farm. I bought this one really cheap because of a damaged fender and the rusty, faded “Rangoon Red” body. I never really did much with it, and it usually sat next to the garage. One memorable project was replacing the fuel line to the carburetor. I used some metal line I found hanging in the barn and carefully bent it to fit. When I started the truck, the new line spritzed little gasoline geysers all over the engine compartment – it was full of pinholes! When I went to take the license plate off the truck before I sold it, I reached up under the back bumper and discovered a wasp’s nest. The wasps discovered me at the same time. I flung my wrench into the air and danced around the yard yelling… things. Then I had to find my wrench again. 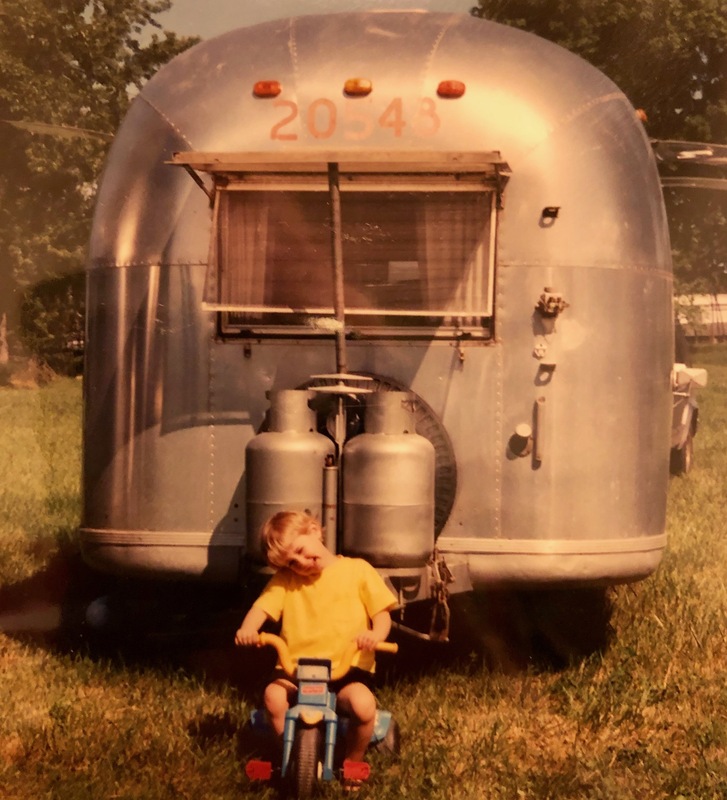 1969 Airstream Safari – My great grandparents John B. and Irene Crone had an Airstream trailer, and I remember camping with them by Mackinac Island in northern Michigan when I was very young. 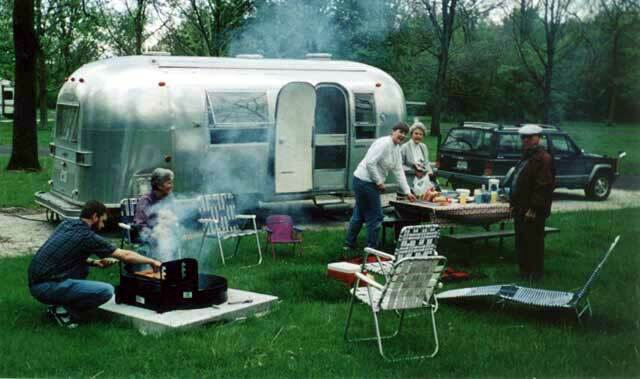 Anna-Lisa’s family had an Airstream when she was a girl and they travelled extensively. We wanted to share similar memories with our kids. 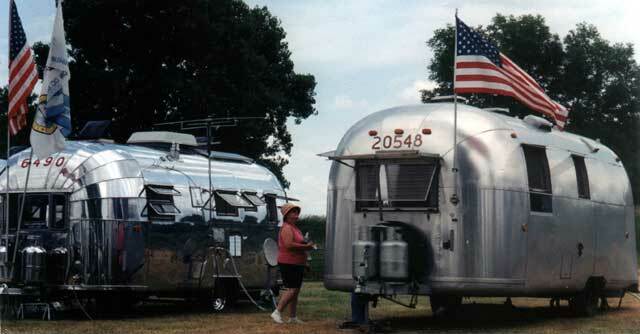 This Airstream popped up for sale near Champaign, Illinois, and proved to be almost the exact same model as Anna-Lisa grew up with. 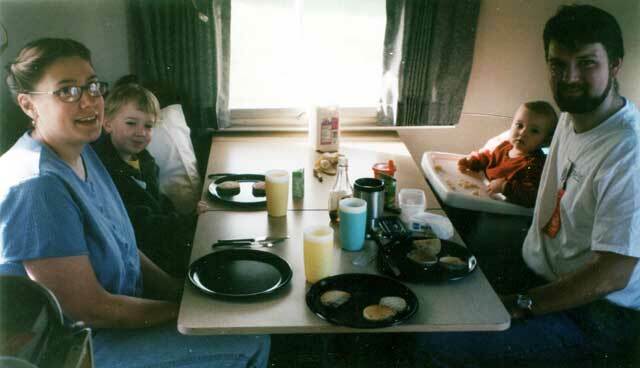 We especially liked the big front table for eating meals and playing games, which converted to a bed at night. 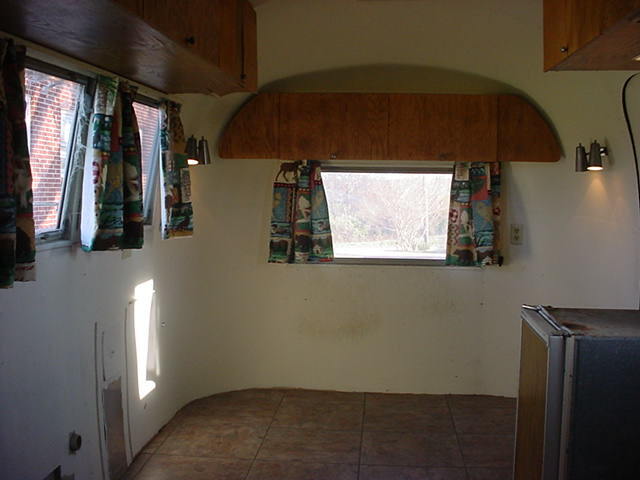 The previous owner had disassembled and rebuilt the trailer, so it was pretty nice inside and out. 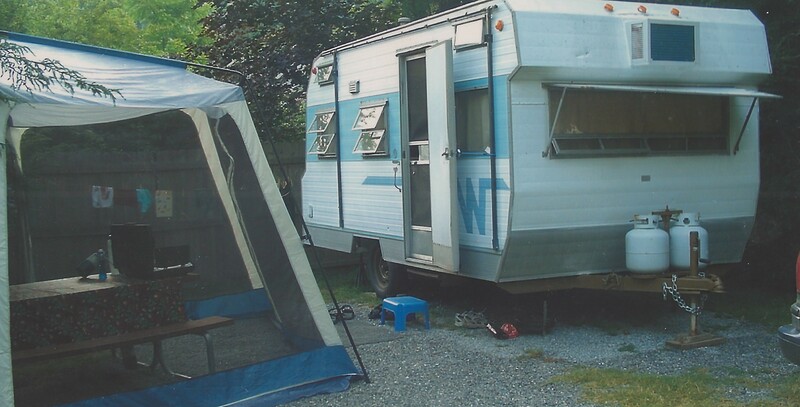 We camped for years in this, including a fantastic trip to the Rockies with Anna-Lisa’s parents. Anna pretended to tow it with her tricycle, replicating a famous Airstream publicity photo. 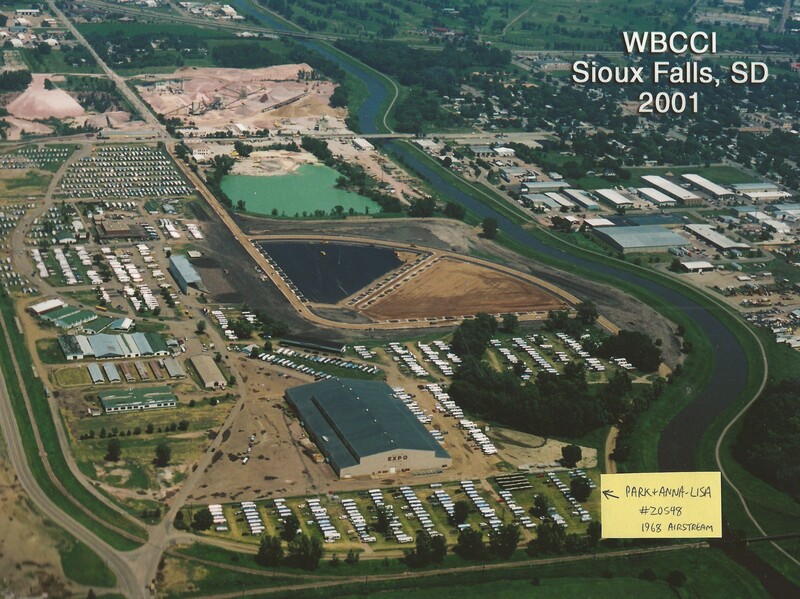 We also attended the 2001 Wally Byam Caravan Club international Airstream meet in Sioux Falls, South Dakota, where we parked with the other vintage trailers in a crowd of 1000+ Airstreams. Sioux Falls was important for two reasons. 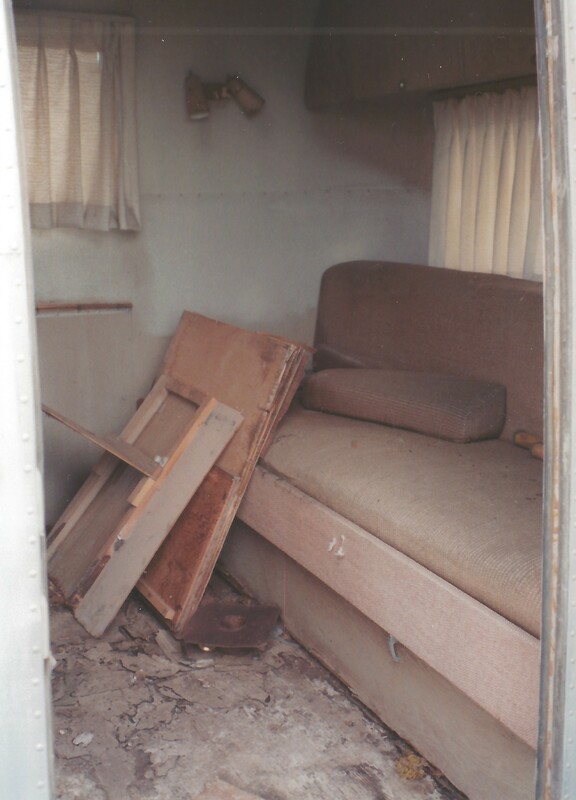 First, toddler Erick learned to cruise by supporting himself and walking around the inside of the trailer… and tearing off pieces of trim along the way. We went to Walmart and bought him a walker so he could play outside. Second, the summer heat drove us to discover Culver’s frozen custard, which continues to be a family favorite now that we live in Wisconsin. 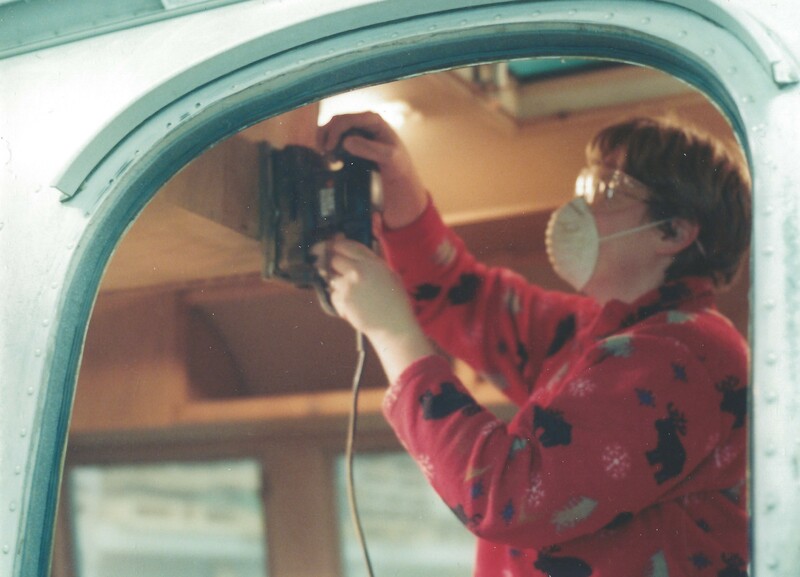 The restorer of our Airstream was a little slipshod in his work, so mismatched screws were always falling out. 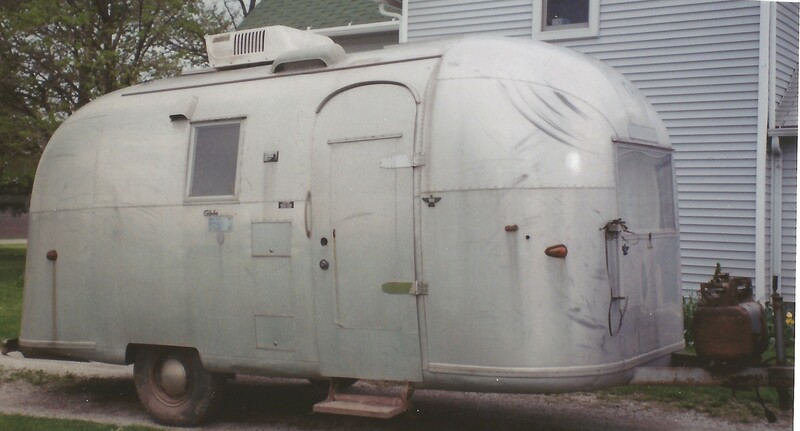 Eventually, we decided that we would like to buy an Airstream shell and custom-build our own trailer, “doing it right.” I posted the ’69 Airstream for sale online and had something like 30 inquiries before the next day. Oops – probably should have asked more. The buyer lived in California and hired a flatbed semi to pick up the trailer, which meant I had to back it up the ramp at a local tractor dealer and down the length of a 50-foot flatbed without tipping it off the side. Quite a challenge. This is one of the vehicles I wish we hadn’t let get away. 1979 Ford Pinto Country Squire Wagon – What a find! This clean Pinto woodie was sitting on a used car lot in Lafayette, Indiana. If memory serves, it only had 60,000 miles on it, which was amazing. With the trade-in on my Mazda, I paid a few hundred bucks. Pintos get a bad rap, but this was a great car. It didn’t run well at first, but I found an experienced old mechanic who went through the myriad vacuum lines fixing leaks, and then it was a smooth driver, if not fast. The 4-speed manual was fun to shift, and the rack-and-pinion steering was a pleasure. It even had good air conditioning! The interior was a funky ’70s blue-and-brown plaid. 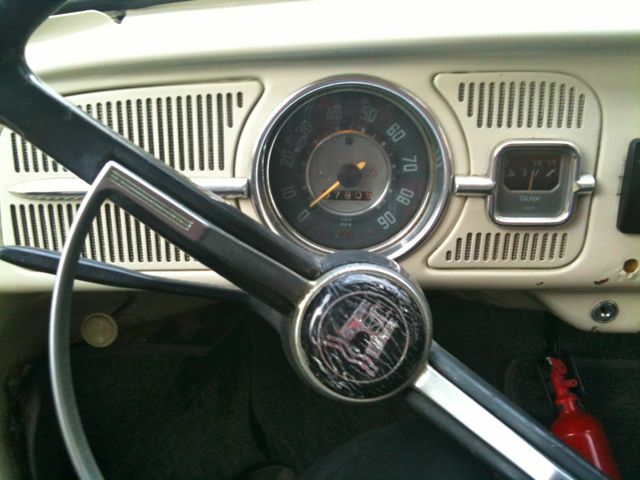 A very 1970s quirk I discovered – the cruise control would not take a set above 57mph, apparently because of the double-nickel national speed limit. This is the first car my kids really remember riding in. Unfortunately, rust began to show up after a few years, and I traded it to a postal carrier who planned to make his rounds in vintage style. 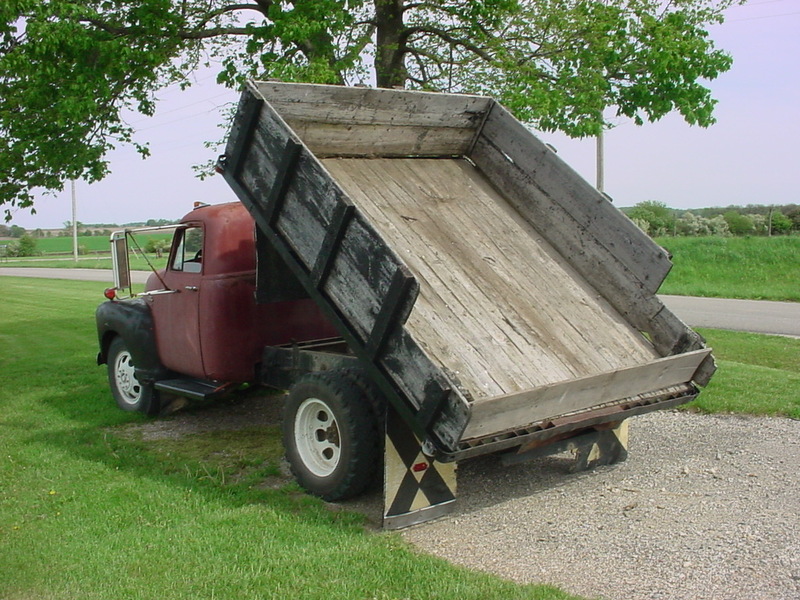 1952 GMC 1.5 ton dumptruck (“Brutus”) – I still had a truck bug to scratch. This is the one that got away, and then came back again. Brutus first showed up for sale on my drive to work. But by the time I was ready to buy the truck, it had disappeared. Then I saw it again months later not far from my house near Marshfield, Indiana. 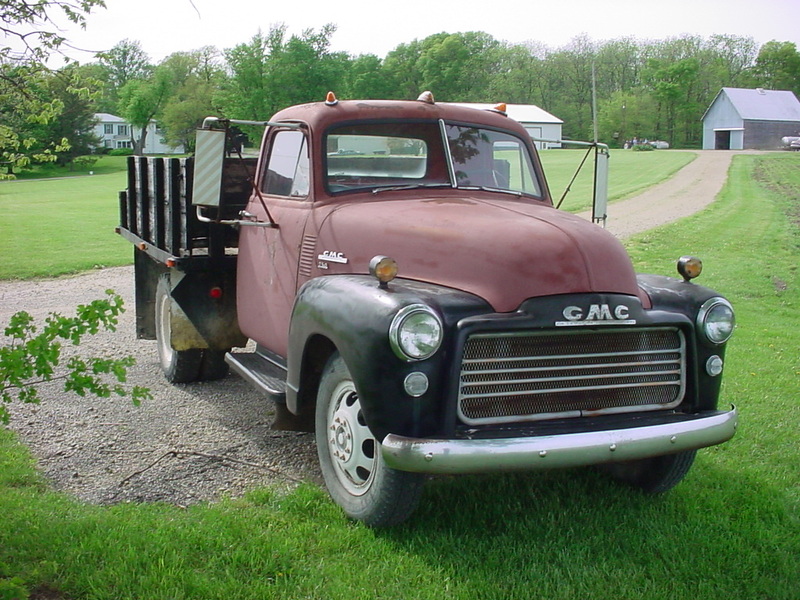 The owner had bought it mostly for the grille to use on his own GMC restoration project. He fabricated a new grille out of tubing and wire mesh and sold me the truck. Brutus was fun to drive, with a big ol’ straight six engine dumping through custom dual exhaust headers and cherry bomb mufflers. The truck cruised at about 45mph. Not fast, but it sure did have a nice rumble and crackle. 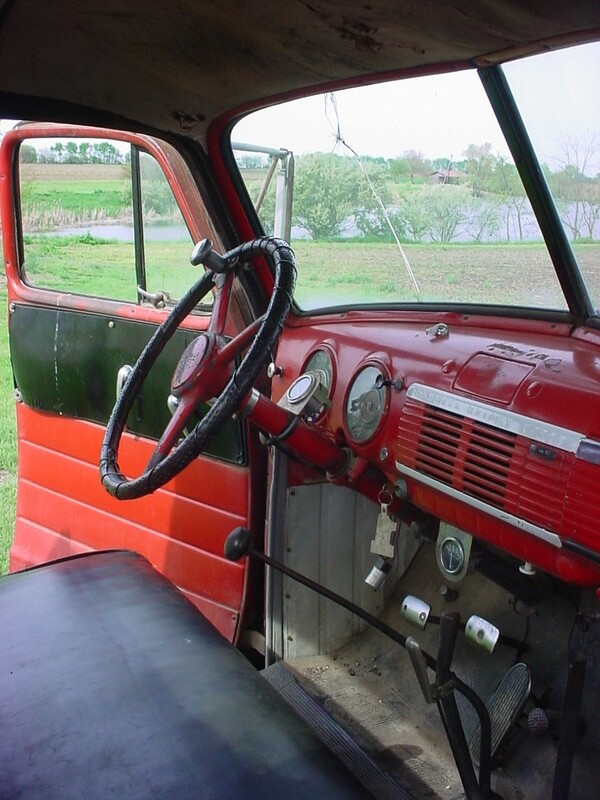 With a big vinyl bench seat, a smooth red dash, round gauges, and a long shifter, the interior was classic truck in all the right ways. And it had a working dump bed! The brakes were weak and grabby, so I mostly used it around the house or for occasional short trips to Powell’s lumber yard in West Lebanon. One early spring I drove it farther to my office in Williamsport. On the way home, the brakes and patchy ice on a gravel road conspired to nearly kill me as I skidded toward a concrete bridge on the corner – but by some miracle the front wheels grabbed a rut and yanked me around the curve. Whew. Anna and Erick and their friends loved to climb in the bed and go for rides, or climb up behind the wheel and pretend to go truckin’. My daughter liked to decorate the grille with dandelions, which somehow makes me think of Ferdinand the bull. When I built the kids a treehouse, Brutus’s bed made an ideal work platform four feet off the ground. Of all the trucks I’ve owned, my personal favorite. I only sold it because I went into ministry and had to move to North Carolina. 1987 GMC Safari panel van – When Anna-Lisa and I opened our computer business, MPH Interactive, we needed panel vans. We visited a dealer in Indianapolis who specialized in used business vans and bought two GMC Safari vans. The older one was my favorite because it had a stick shift. It formerly belonged to the Indiana University geology department and was a hideous gold color inside and out. But it only had 80,000 miles, and the dealer threw in a free white paint job. We bought a bench seat and this Safari did triple-duty working, pulling our family campers, and hauling the Illiana Spikers modular train layout. This van saved my life when a motorist had a seizure, drove into our parking lot in Williamsport, and crashed into the side of the van. I was standing on the other side loading it with computers, and the Safari kept the motorist’s car from crushing me or crashing through the wall of our building. Not long after we got the Safari repaired, we took it to Texas to close out father-in-law Leighton’s house… and in a freak ice storm we got rear-ended, shoved into the car in front of us, and side-swiped all at once! Even in its twice-damaged state, I sold it to another small business owner when I entered the ministry. 1997 GMC Safari panel van – The other panel van for our business, this had a much peppier V6 engine and an automatic transmission. 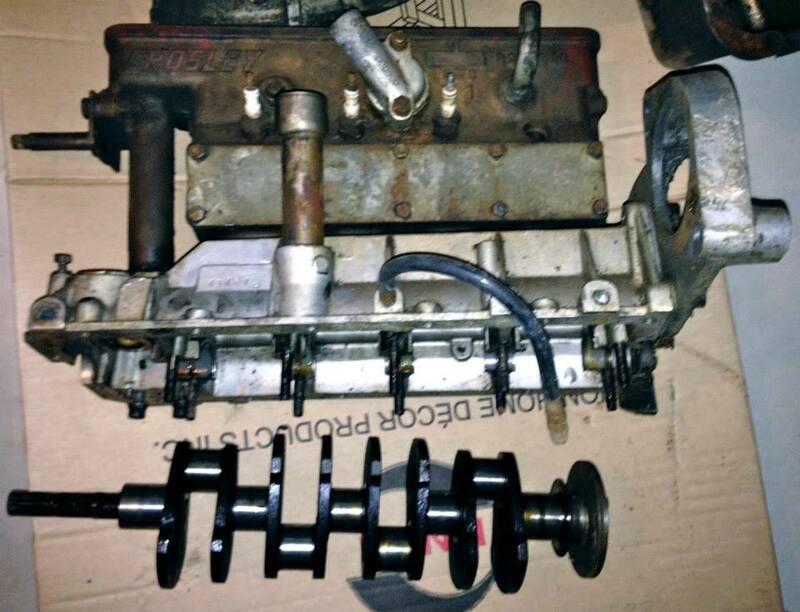 At 180,000 miles the transmission started to fail but was rebuilt under the dealer warranty. A good, reliable, zippy van. But with the light rear end it was a handful on ice. I pulled out to pass one winter east of Attica, Indiana, and the van fishtailed right off the road, flew through the air, and landed in a farmer’s field below. After a check to make sure the van was undamaged (and my pants were dry), I drove to the end of the field, up the lane, and back onto the road, proceeding at a much slower pace. When I was called into ministry and had decided to sell the computer business, but before I’d announced this, a local HVAC contractor walked into my office one day and said his business was growing, and he wondered if I’d like to sell my vans. God at work! 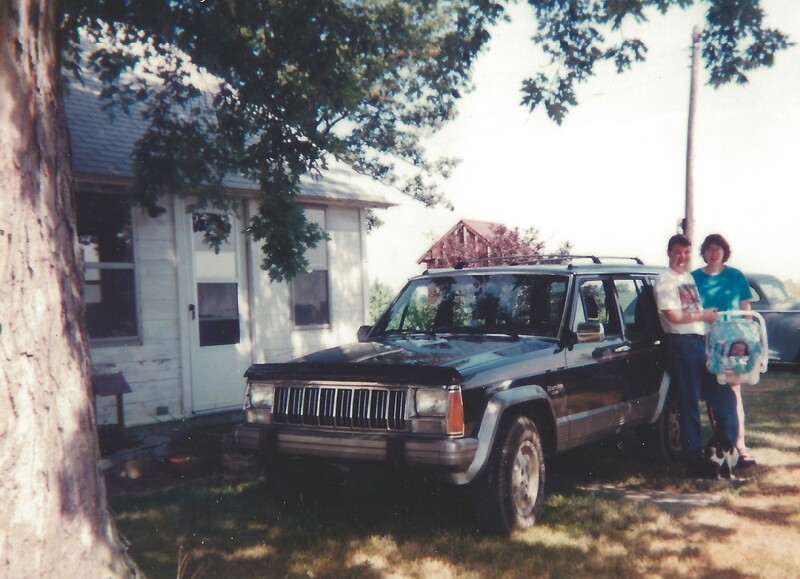 1996 Jeep Grand Cherokee – Our family continued to expand with the birth of Erick in 2000. The black Cherokee felt a little cramped with one car seat and worse with two, so we traded it on a newer, lower-mileage (109k) Grand Cherokee. The Grand Cherokee was bigger, but it was also slower and thirstier. We never loved it quite as much as our first Jeep. 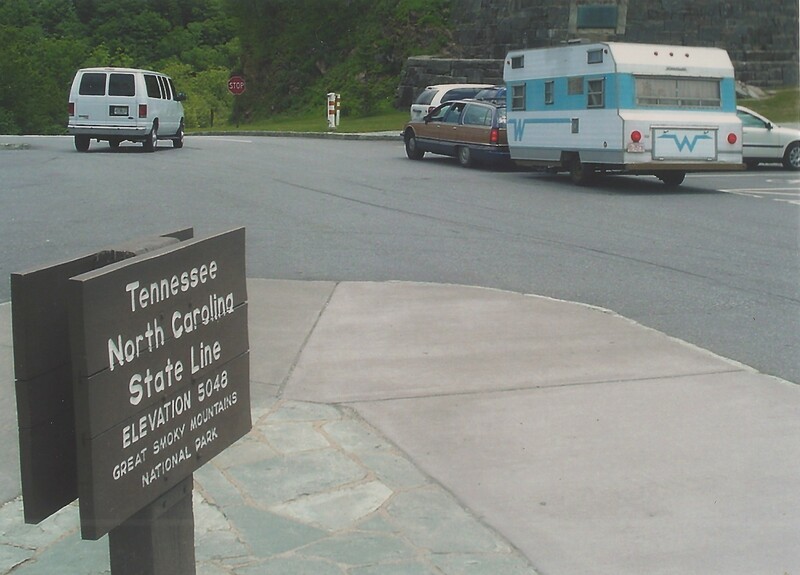 But it served well, pulling our trailers – first the ’69 Airstream, then the ’64 Airstream – on camping trips. 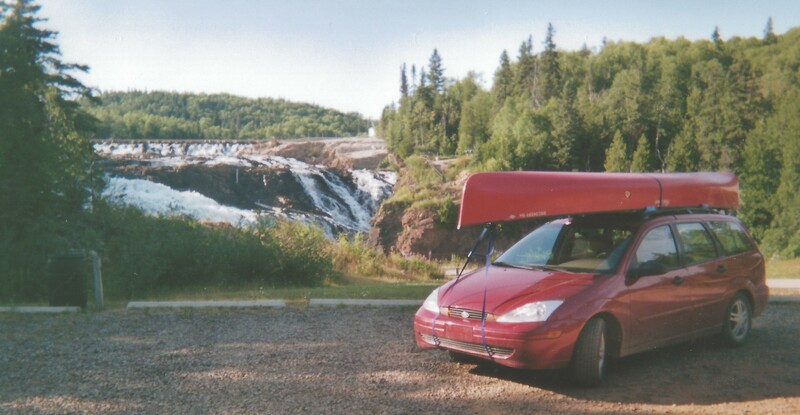 By the way, the red canoe on the roof in the photo was my wedding gift to Anna-Lisa. 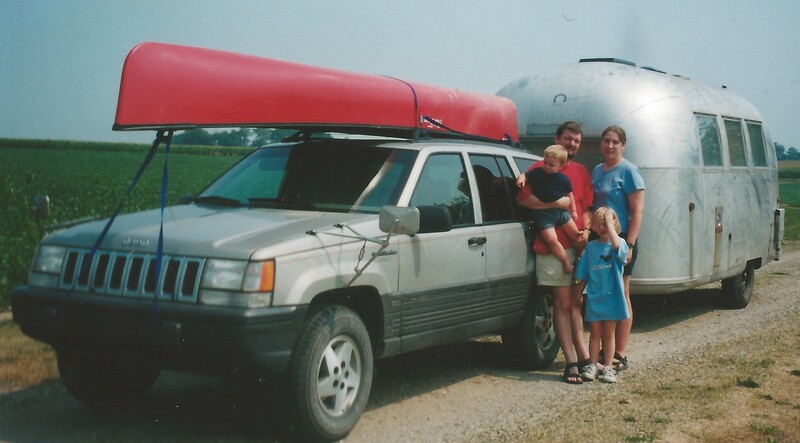 It went with the Rambler on our honeymoon, and was strapped to the roof of many of our cars over the years until 2015, when we sold it to another pair of newlyweds so that we could get kayaks! 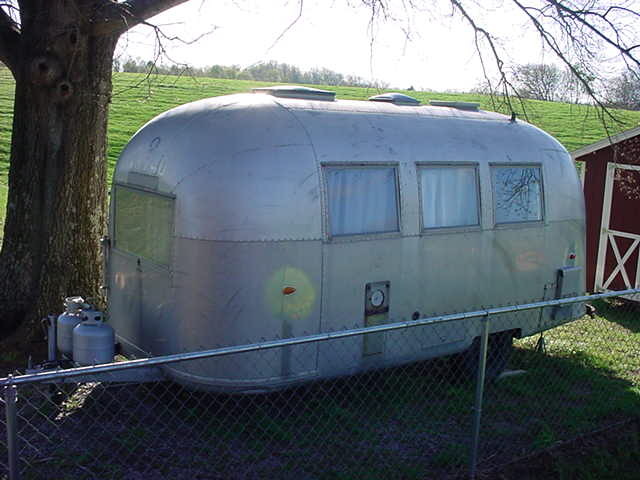 1964 Airstream Globetrotter – After selling our nice 1969 Airstream Safari, we found a ratty 1964 Airstream Globetrotter within 15 miles of home. The Globetrotters were shorter, lighter trailers. This particular one sat without a roof vent cover for years, allowing rain to destroy the interior. It was a good shell with no interior, perfect for our plans to build a custom trailer. We made a lot of progress. All members of the family helped: Park installed the floor and redid the brakes assisted by Erick, Anna-Lisa cleaned off the old paint and cabinets, and Anna painted. We camped on the floor of the trailer, taking it to Florida and Minnesota and other places. The Globetrotter moved to North Carolina with us, but we just didn’t have the time, money, or access to tools needed to make progress. Eventually we sold it. Once again, the buyers jumped on it, making me thing we priced it too low. 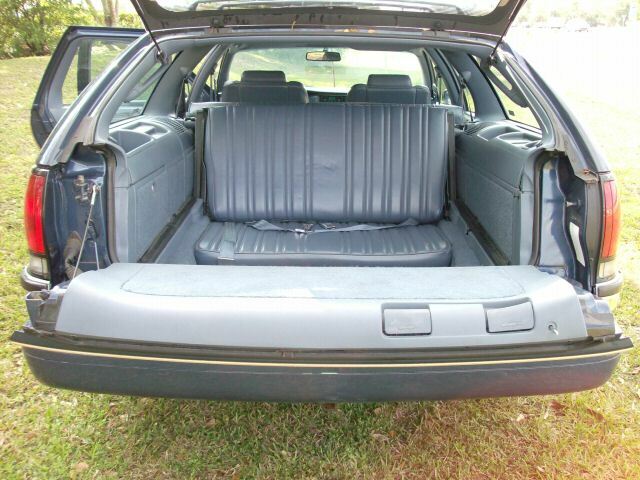 1999 Ford Focus station wagon – When gas went over $2 a gallon (heavens to Betsy, who could imagine! ), Anna-Lisa and I were horrified. We decided to sell our thirsty 1996 Grand Cherokee and get a more fuel-efficient car. I had read good things about the Ford Focus, and we found a nice red station wagon with a manual transmission near Auburn, Indiana. I really enjoyed driving this car, which handled well and accelerated with adequate zip. It was thrifty too, achieving 30+ mpg. College buddy Paul Nord and I loaded the Focus up and went fishing in Canada. Customs at the border couldn’t believe a couple of young guys going fishing weren’t carrying beer, and made us unpack the whole car. 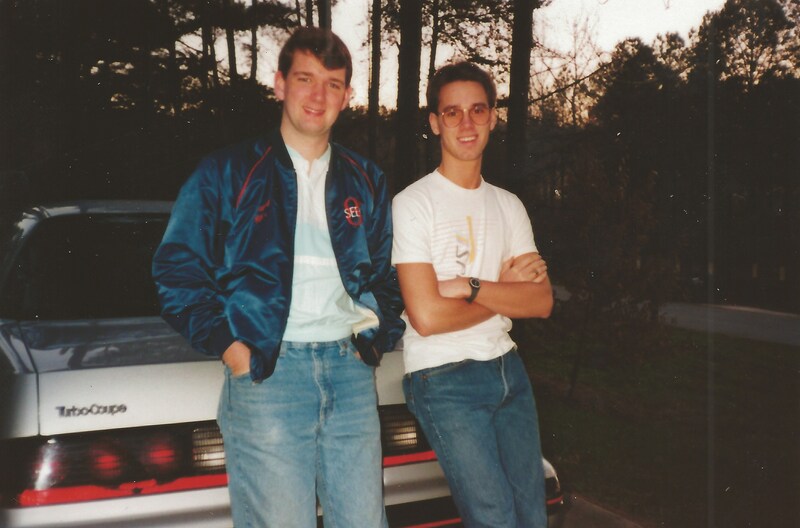 The Focus moved to North Carolina and became my daily-driver to seminary, a 100-mile round trip. It didn’t take long to add 100,000 more miles to the odometer! Amazingly, despite my seminary commute being through rural areas filled with deer, I only ever hit one. 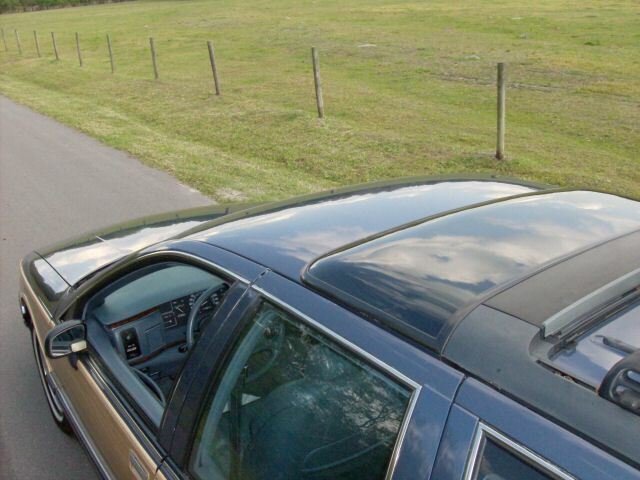 It bounced off the hood without doing damage to the car or the deer. Divine protection for a sleep-deprived student pastor? We only sold this car because Anna-Lisa’s father Leighton practically gave us his low-mileage 2006 Kia Optima, and we didn’t need the third car. 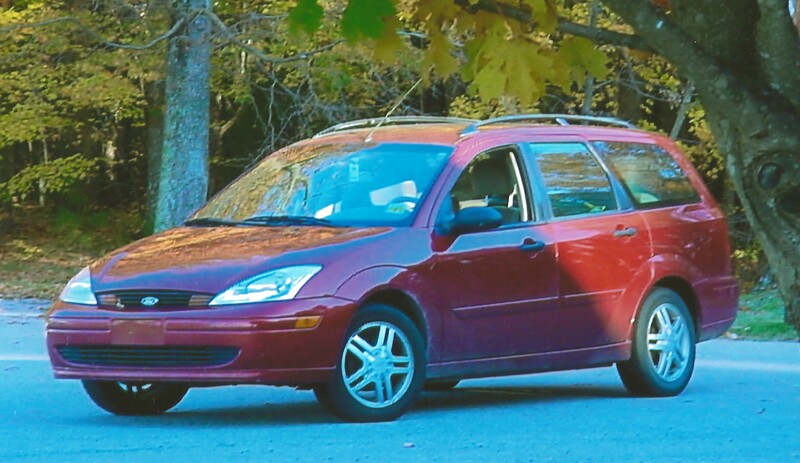 The red focus is missed – especially since Ford stopped building the station wagon model. 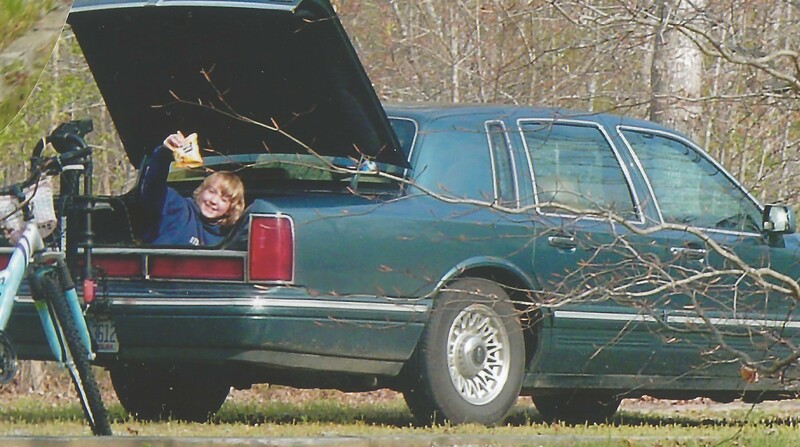 1994 Lincoln Town Car – A very special car for our family. 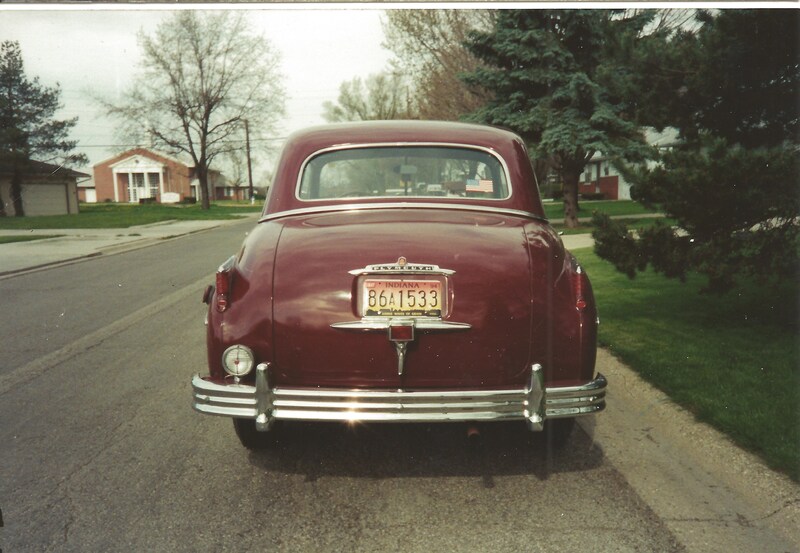 Grandpa H. Park was a Lincoln Town Car man. He owned several generations of these big, smooth cruisers with full frames and heavy bodies. His standing joke with buddies who preferred Cadillacs or @*!$ foreign cars was, “Let’s you and me go out on the highway and drive toward each other at 60mph. 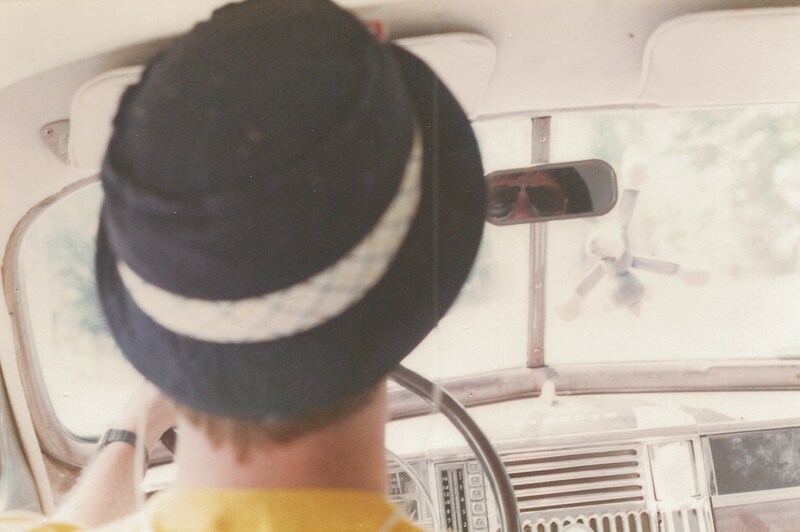 I’ll honk on the way through.” This was his last Town Car, and it was a beauty – dark green with tan leather interior. It had nice aero styling. Grandpa maintained it carefully, but eventually he couldn’t drive anymore. At the time we were looking for a trailer-towing vehicle to replace the Grand Cherokee and my business vans, and I was about to enter ministry. He sold us this car for $400(!!). We took it to North Carolina, pulled two different trailers with it, tent-camped on the Outer Banks, and just generally enjoyed it. At 18.2 feet, the Lincoln was almost as long as old Edna, but the 4.6-liter V-8 was able to loaf along on the highway and achieve an impressive 24+ mpg. The Lincoln’s interior was huge, comfy, and had a nice leather smell. The trunk was enormous and the kids loved to play in it. The self-leveling rear air suspension did fail once, causing the rear end to rise several inches and giving the car a hot rod Lincoln stance. And when pulling the Winnebago back from Indiana, the plastic intake manifold cracked, sidelining the car in West Virginia. Anna-Lisa came and picked me up for an evening Thanksgiving service while a local shop installed a metal manifold from another 4.6 V-8 in a junkyard. 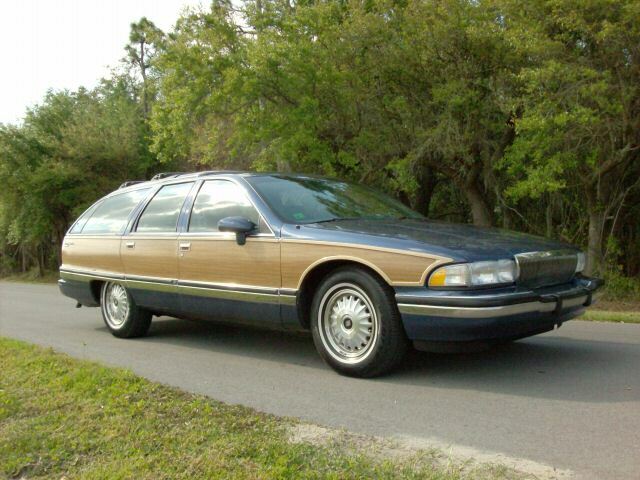 Eventually, when we were about to adopt Cameron, we decided we wanted even more room and sold the Lincoln in order to buy a full-size Buick Roadmaster station wagon. I still miss it. 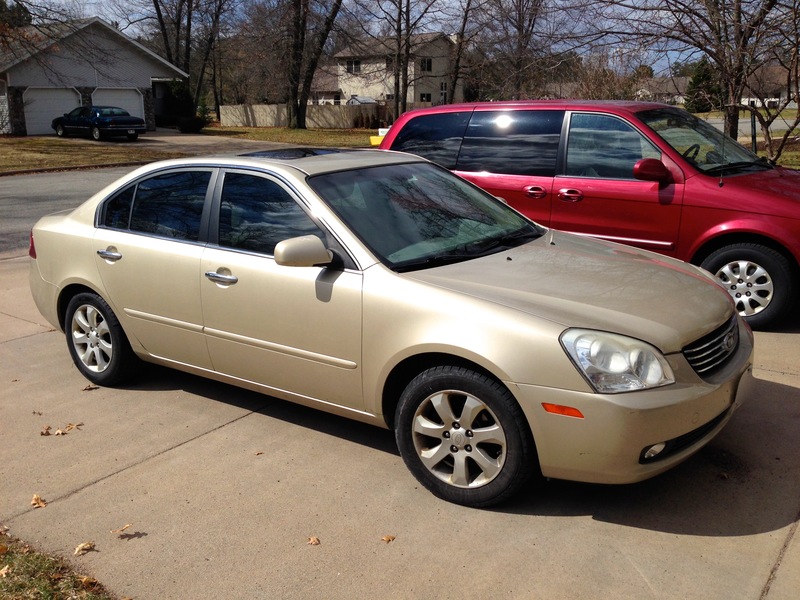 2006 Kia Optima – Another family car. Anna-Lisa’s father Leighton was not supposed to drive anymore because of early-onset Alzheimer’s. He had just purchased this Optima new. To remove the temptation of driving, the family agreed we should take it. Anna-Lisa flew to Austin, TX and drove it back to North Carolina. On arrival, it still had only 5,000 miles. This was a nice, semi-luxurious car with a powerful V-6 and several luxury features. A not-too-exciting but reliable car that served us well for several years. For a poor student pastor and seminary student, this car was a heaven-sent gift. The red Focus wagon was sold to make room for the Optima. 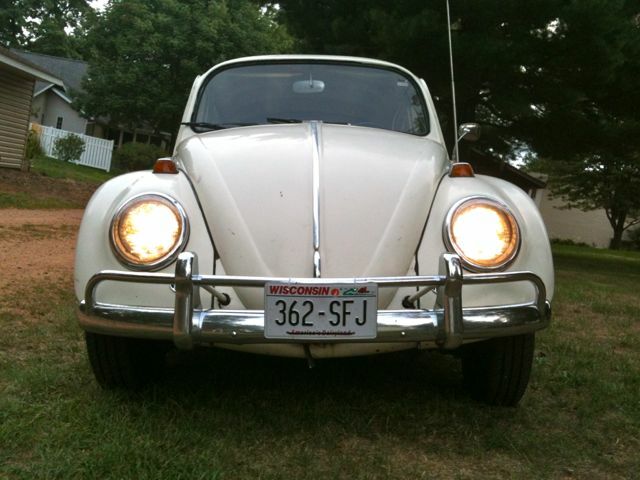 I drove it to Duke regularly, and it moved with us to Wisconsin. We put well over 100,000 miles on it in just eight years or so. 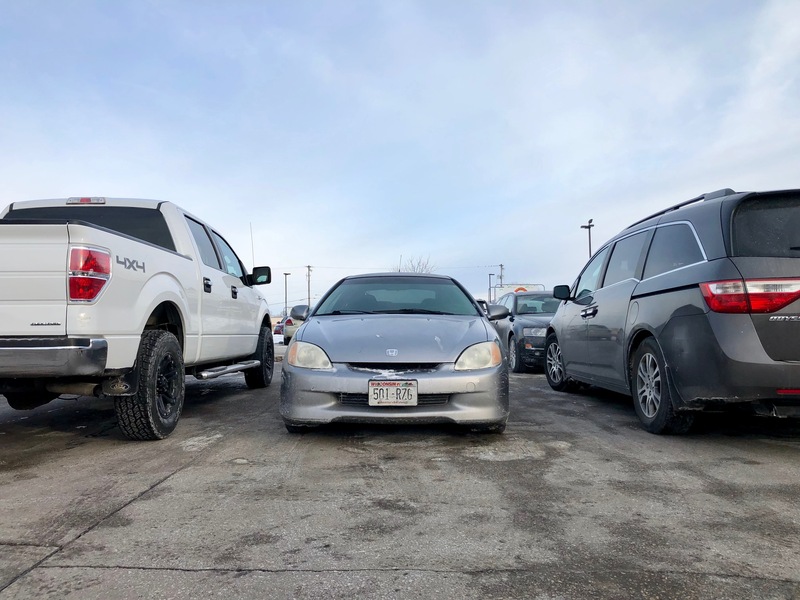 We finally sold the Optima when I had the opportunity to purchase the 2002 Focus SVT… so this car was bracketed by two Focii. 1966 Volkswagen Beetle (“Herbie”) – Paul Bottari’s beloved VW Bug, a little ratty but basically a nice driver, traded to me even-steven for the Winnebago camper, and a win-win for everyone. I enjoyed this stylish little car mostly around home, though I did drive it the 100-mile round trip a few times to Duke when I was feeling confident. The clutch cable broke twice, necessitating a push from my junior assistant mechanics. Another time, it started running funny, and I discovered it had popped one of the four spark plugs out. 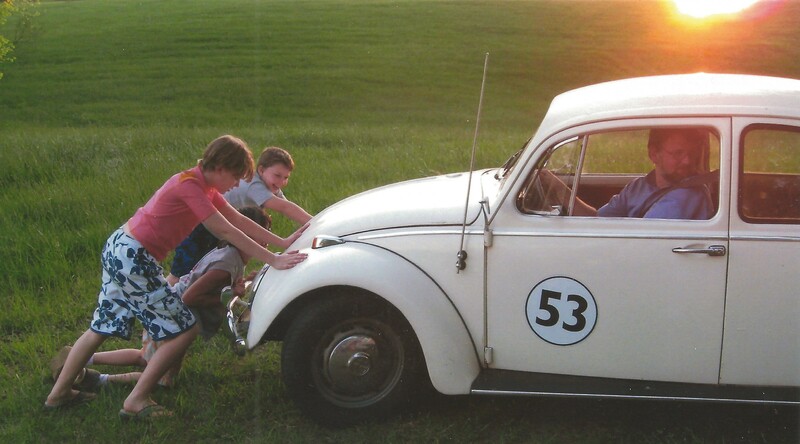 All three kids got to practice driving Herbie and shifting a manual transmission on the long lane by New Hope church. Bonus: the Beetle came with magnetic decals to replicate Herbie the Love Bug. Herbie was popular in car shows and parades. We brought him back from North Carolina to Wisconsin. But after a few years I was ready for something different. We sold Herbie and I began looking for a Crosley. 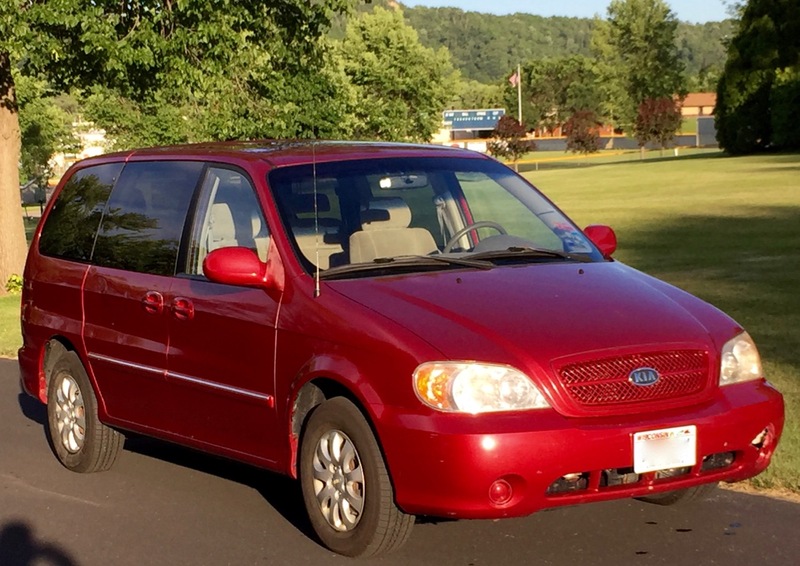 2005 Kia Sedona (“Lena,” aka “The Mama Llama,” or “The Burgundy Beast”) – When the Roadmaster proved unreliable, we finally gave in and bought a minivan. Church member W.D. Pleasant worked at the Chrysler dealership in Danville, VA and showed us two options: a Chrysler minivan with 120,000 miles for $6000, or a Kia minivan with 60,000 for the same money. We traded in the Buick and drove the Kia home. This was the last year of this generation of Sedona, and it was antique by minivan state-of-the-art: as heavy as the Roadmaster, with heavy seats that didn’t fold into the floor, and minimal bells and whistles. But it had a very powerful V6 engine, and all that weight made it a stable trailer-tower. 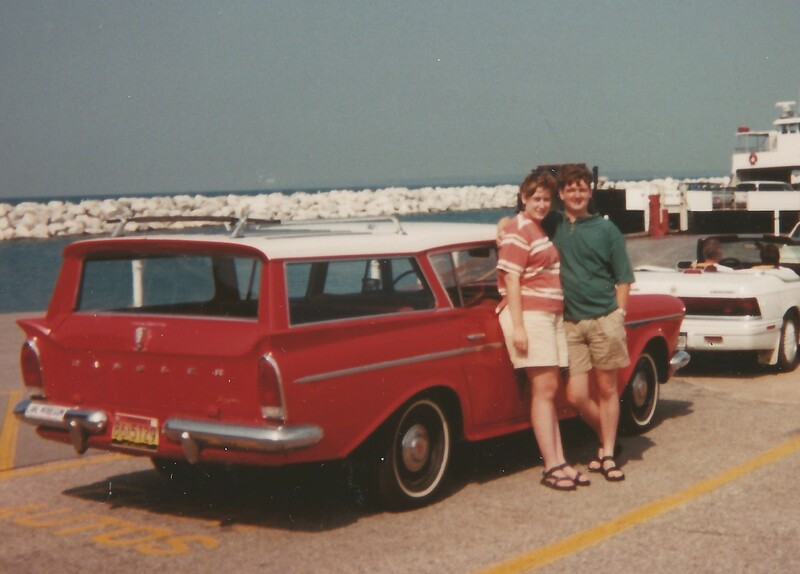 We drove all over the US in this Kia, including our move to Mosinee, WI and later to La Crosse. It towed my Crosley to the Wauseon, OH meet. It towed our trailer on vacations. 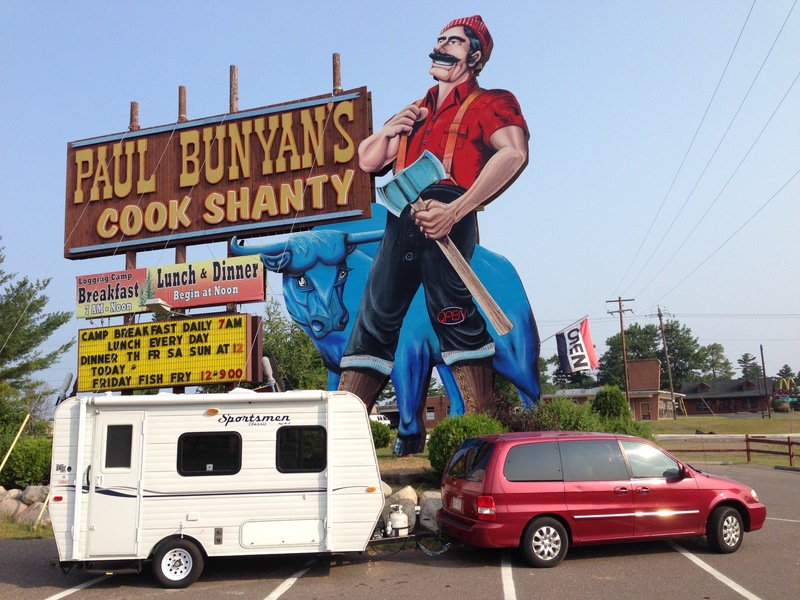 It hauled Boy Scouts to Yellowstone and to Isle Royale. It just worked. Sometimes boring is good! We put over 100,000 miles on the Sedona over the next nine years. The kids called it the Mama Llama because it served as Mom’s taxi, or the Burgundy Beast for its hauling capacity. We also nicknamed her Lena, the sturdy sensible spouse of Ole in the Ole and Lena jokes. After nine years, age began to catch up with Lena. Around Christmas 2018 she suddenly went pop, and then sounded like a lawnmower as I sputtered the last few blocks to home. A spark plug had come loose. Worse, we discovered that the threads were stripped in the head. So I got to install a helicoil thread insert, working outside in January. Brr! After that we didn’t trust Lena with the high-stress job of trailer towing. I ended up selling her for $1000 to a buddy’s brother, who urgently needed cheap, reliable wheels. 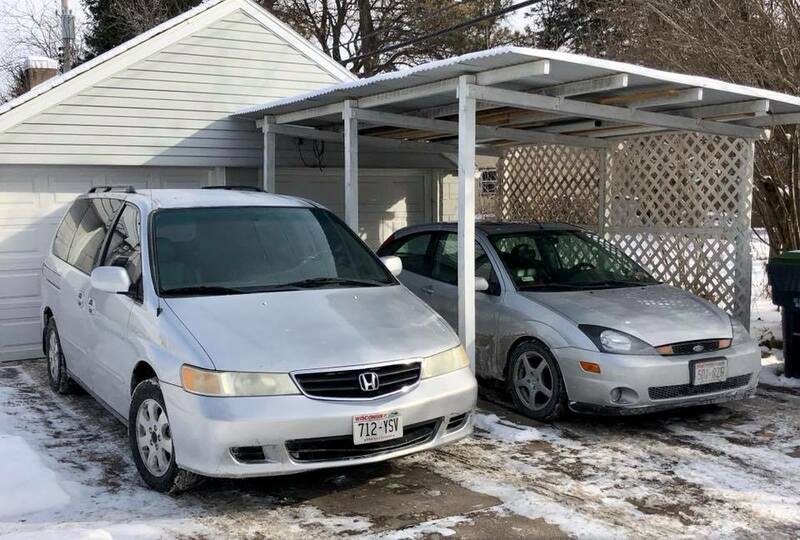 Then I went and bought the 2002 Honda Odyssey (below), which did not compare well to Lena. 2011 KZ Campers Sportsmen – After moving to Mosinee, WI, we were ready for a new trailer. 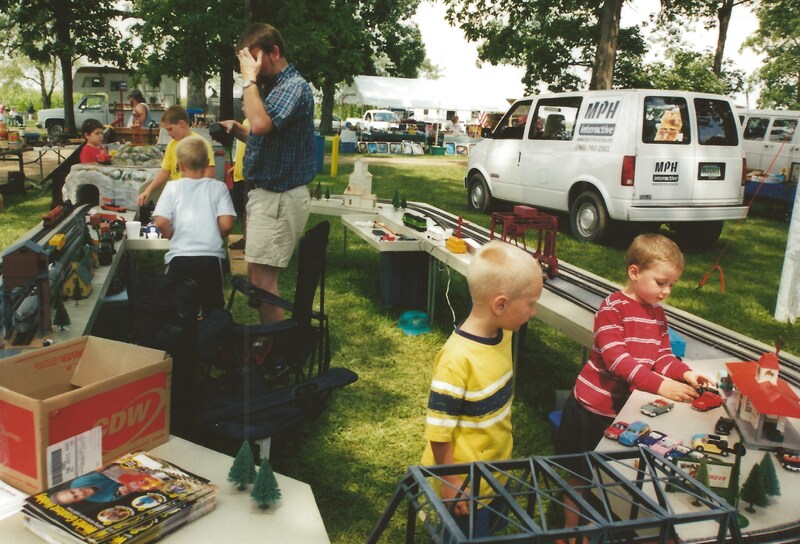 King’s Campers in Wausau carried the KZ Sportsmen line, designed and built as simple, lightweight, minivan-towable trailers. In many ways they were like our old 1960s trailers. 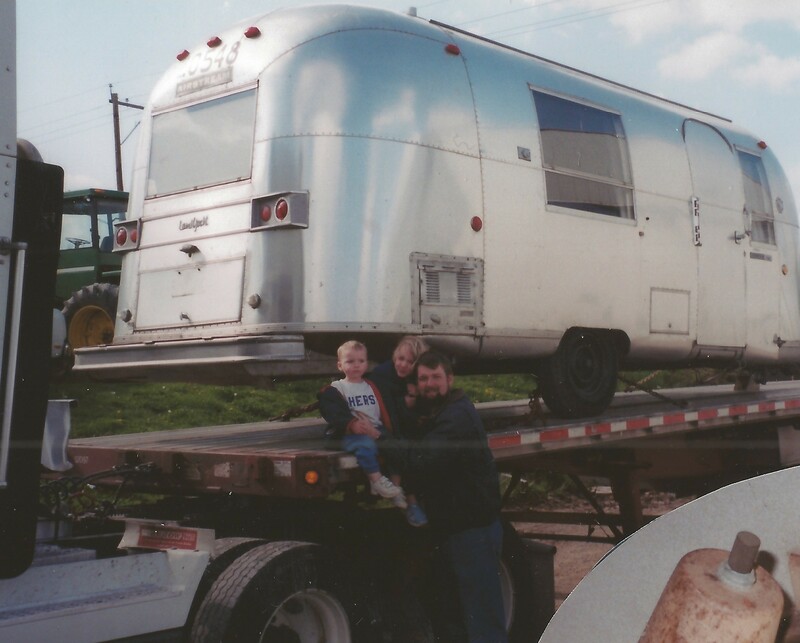 Anna-Lisa had inherited some money from her mom, and we thought a family trailer would be a good way to honor her memory. After looking at 16- and 18-foot trailers with the kids, when we went back the next day they had a 14-foot last year’s model on clearance. It had a bathroom, and small kitchen, and big table that converted to a bed. The table was great for family dinners and big board games. What it didn’t have was beds for the kids. They weren’t thrilled to be evicted to the tents at night, but they made do. The little Sportsmen has been a terrific camper. For Anna-Lisa and I, it is a peaceful place. 1948 Crosley (“Ole”) – Crosleys are weird, Indiana-built super compact cars from before and after World War II. My neighbor Grover had a few back in Indiana, and I’d always been interested. 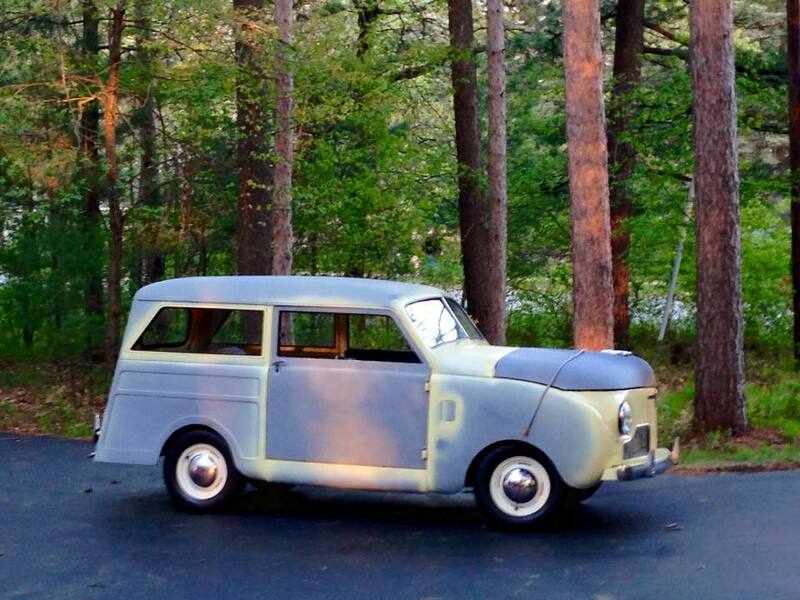 After selling the VW Beetle to make space, I bought a 1948 Crosley station wagon for $800 out of Minneapolis. It was a man-sized erector set, fully disassembled by a previous owner. It included the rare and weird COBRA (COpper BRAzed) sheet steel engine. Son Erick prompted me into getting moving on the project and we got the engine running on a test stand in the garage. 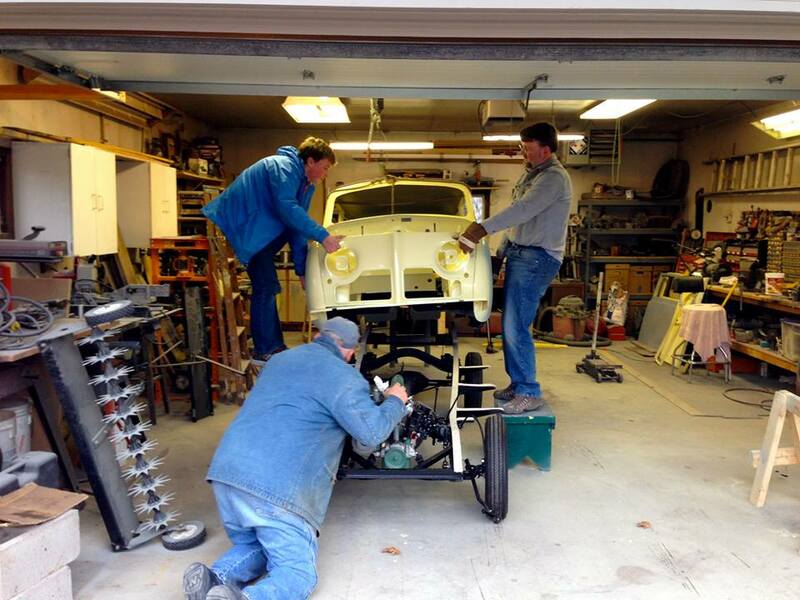 Then church member Randy Borth adopted the project and we got the frame and body assembled. Erick and I took the incomplete but drivable car to the 2014 Crosley National Meet in Wauseon, OH. Old Crosley pros taught us the finer points of double-clutching the non-synchro transmission. Erick loved driving the car around the back lanes of the fairgrounds. I also drove it it through my church in Mosinee, WI. When we moved to La Crosse, progress stalled again. 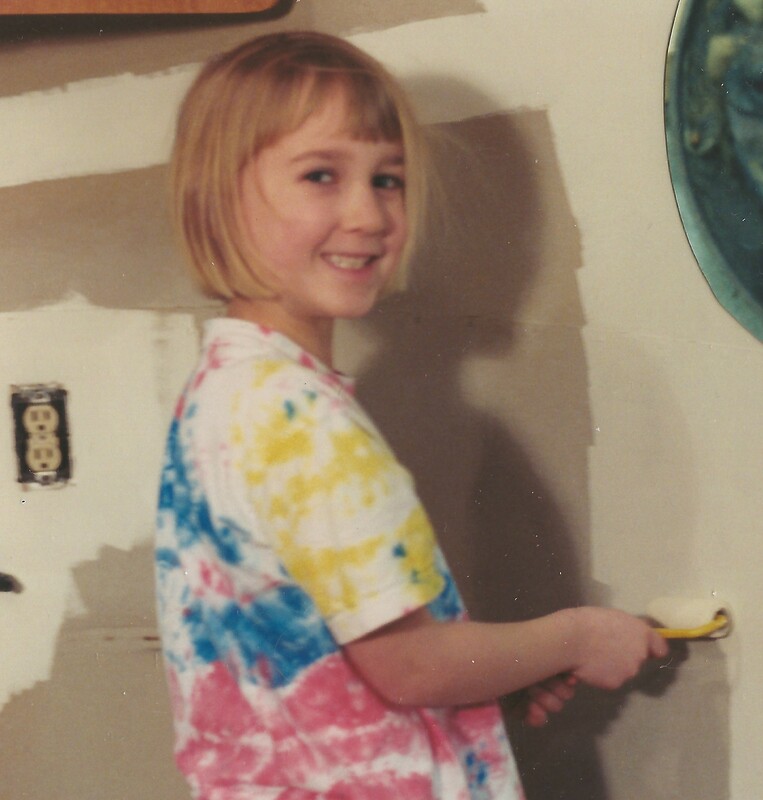 I have an extensive Facebook photo album with 600+ pictures of the restoration process. 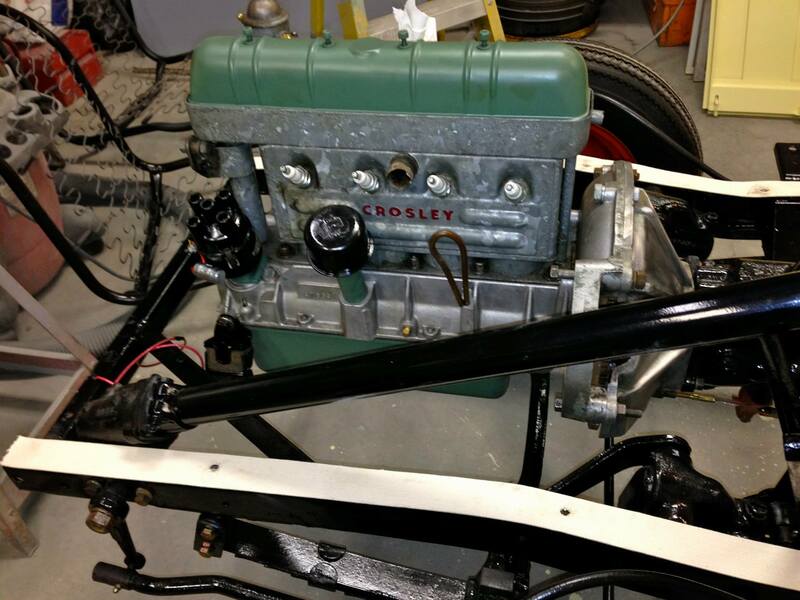 1952 Crosley – Purchased as a parts car for $300. Erick, Cameron, and I drove to Indianapolis to pick this up, stripped off all the parts we could, then stash the carcass in a barn. All in one long weekend! My dad aided and abetted by providing space in his shed to store the remains. My brother, who had to drive farm equipment around the hulk, was less amused. An amazingly rusty car – rust in the roof, rust in the floors, rust flaking in our eyes as we worked under it – but it came with a lot of great engine parts. Erick liked to drive it while coasting downhill on the farm lanes. After a year or two I sold the carcass to a guy from Ohio who planned to patch up the wagon body and graft it onto an old Shriner’s clown car to build a Crosley rat rod. 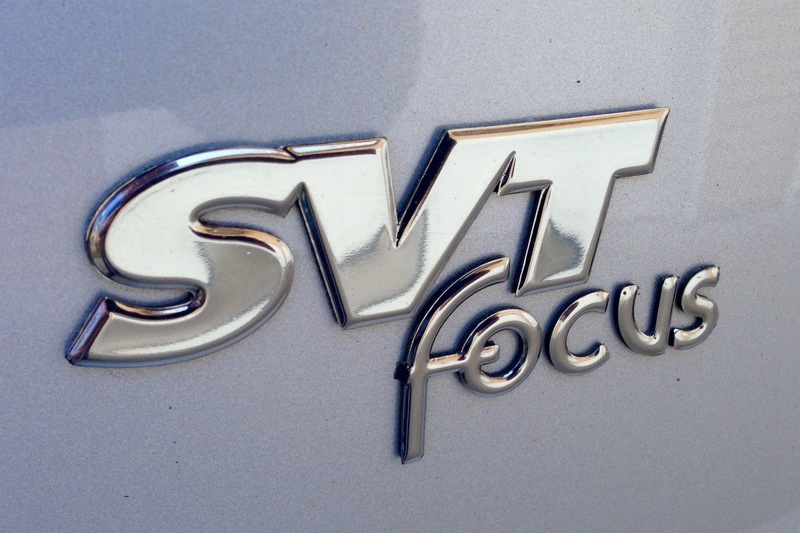 2002 Ford Focus SVT (“Sven”) – Sven was a special car in several ways. First, I missed my little red Focus wagon. 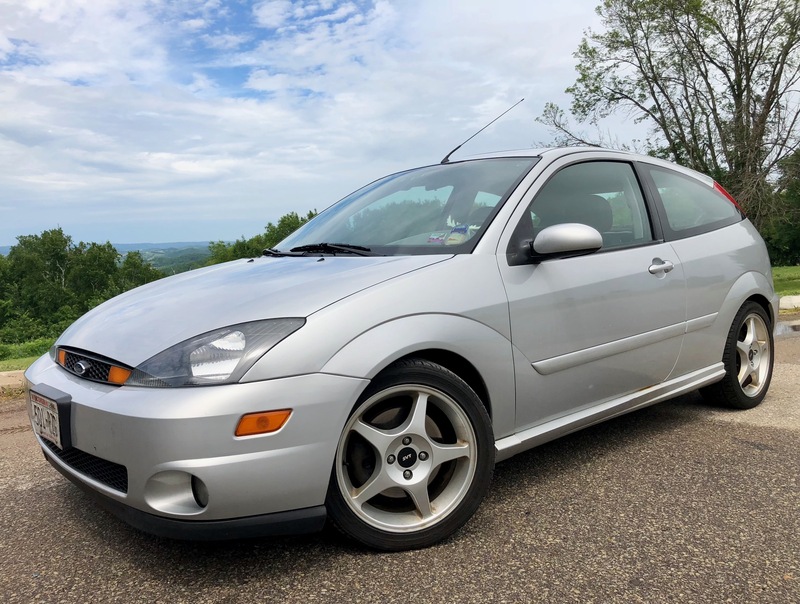 Second, back in 2001 and 2002, Ford’s “Special Vehicle Team” (SVT) had built a limited-edition SVT Focus with a hotter engine with variable intake geometry, special German 6-speed transmission, suspension tweaks, and nice subtle interior and exterior upgrades. Third, Nelson “Woody” Woodruff, a retired engineer at Mosinee UMC, had purchased this one new and meticulously maintained it for years. 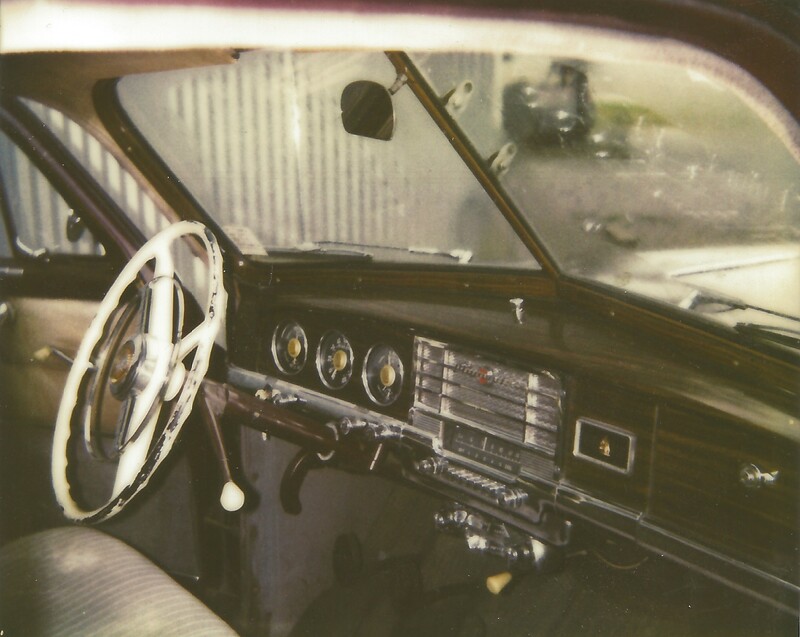 In the winter, the SVT sat in his garage while he and his wife travelled on mission trips. When I heard Woody was selling the SVT, I jumped at the chance to own it. We sold the Kia Optima to make space in our stable, and I got to drive a sporty little hatchback Focus once again. Sven is definitely a thoroughbred – high strung and high maintenance. He revs up high when started and it takes a while for him to settle down. Sven demands premium gas and only gets mid-20’s fuel economy. We’ve replaced tires and the catalytic converter, a water pump, and any number of O2 sensors over the years. Sven demands snow tires in the winter and even then isn’t that great in the slick stuff. But it is sure fun to rev that rorty-snorty little engine through the gears and carve up a country road. Daughter Anna learned to drive stick shift in Sven and found a stuffed moose for the dashboard. She is fond of the little spitfire. 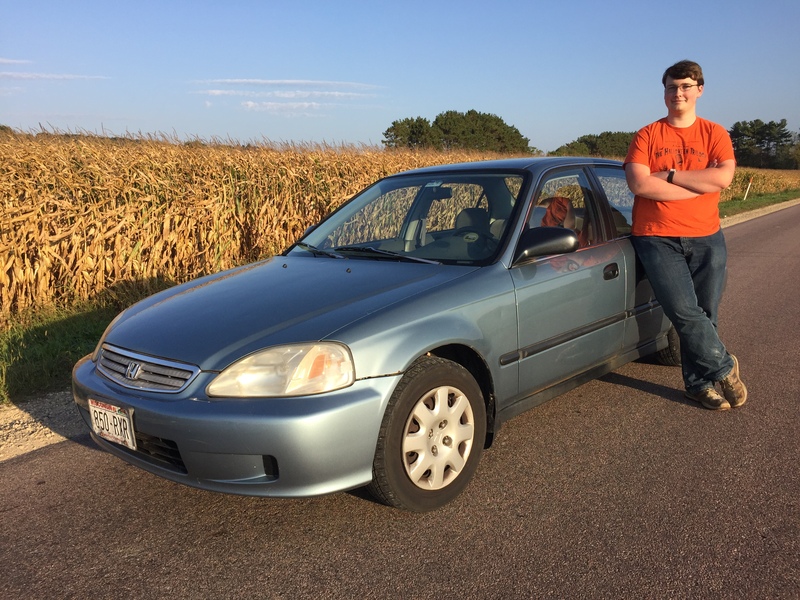 1999 Honda Civic LX (“Pearl”) – My son Erick’s first car. My co-worker Paul bought this new and put 160,000 miles on it, driving it through college and delivering pizza. He sold it to us for $500 because it used oil, but otherwise this was a nice-running and driving car. 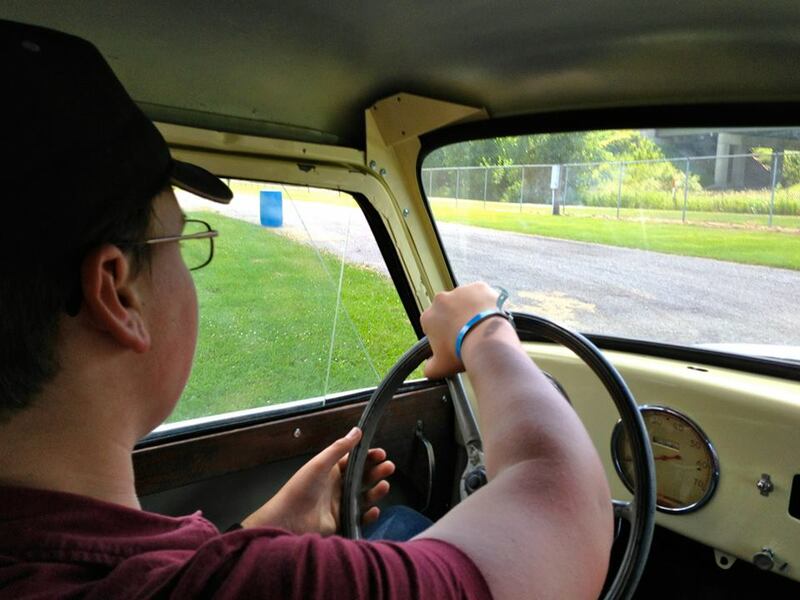 Erick got his learner’s permit, and practiced both driving and stick shifting in Pearl. The tester for the driver’s exam was surprised when Erick showed up in a car with a manual transmission – that never happens anymore. We did some maintenance, especially when the gas line rusted out. 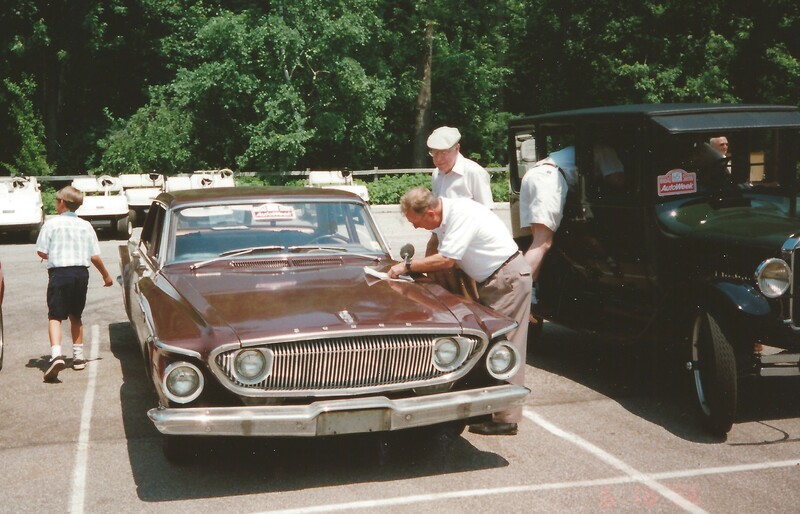 Mostly, we poured in oil… about a quart every 500-600 miles, more when we pushed her hard on the interstate. Erick drove Pearl to his jobs at Dunkin’ Donuts and Toppers Pizza. After a year of responsible car ownership, Erick was ready for something old and quirky (wonder where he got that from). We traded Pearl plus some of Erick’s hard-earned cash for Rhonda the 1965 Rambler. 1965 Rambler Classic (“Rhonda”) – Rhonda really is Erick’s car – his money, and his name on the title. But I’ve put a lot of time and love into it too. Rhonda came in a mix of baby blue paint and primer. The famous AMC 232 straight six engine is a good, reliable runner. Backed up by a 3-speed manual with overdrive, it is also a fairly thrifty car. Erick wanted a car he could drive and learn to work on. Rhonda has served both capacities well. 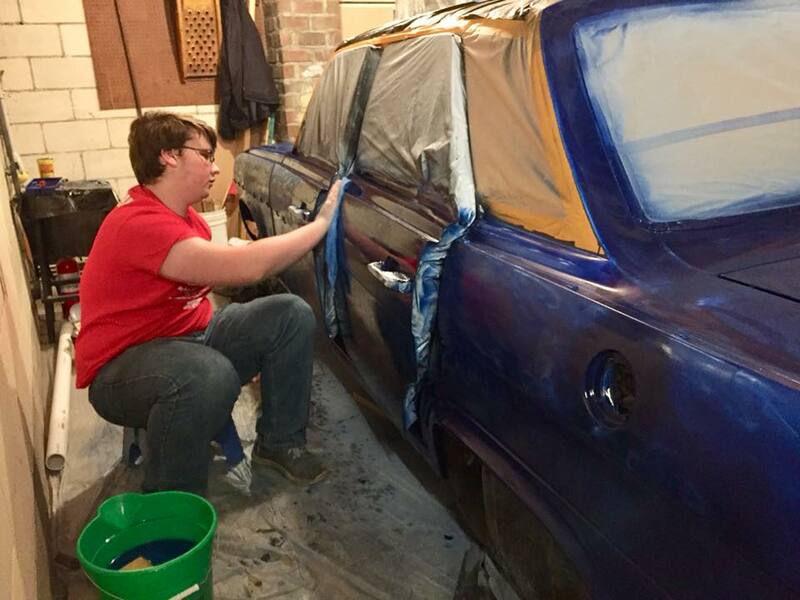 An early order of business was painting the car using Rustoleum. This took almost two months but turned out well. 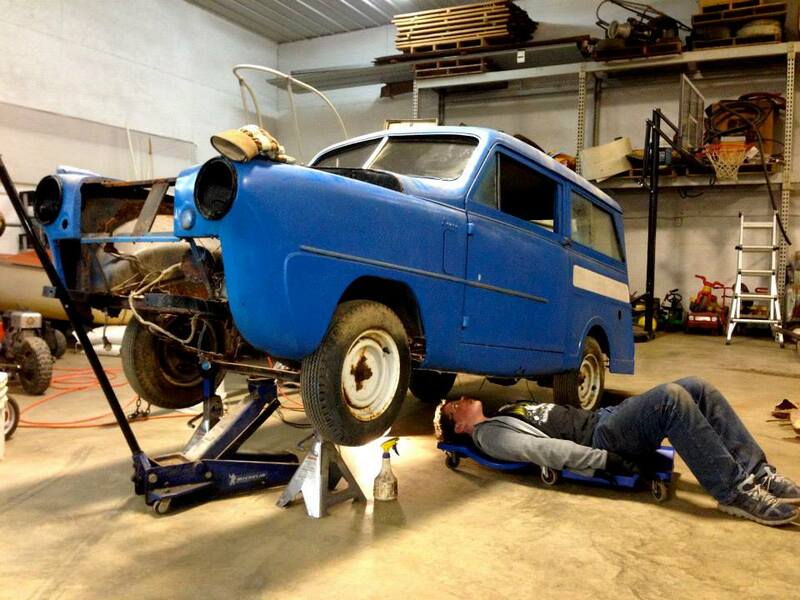 Erick has rebuilt the carburetor and the brakes, patched the body panels, and done numerous other minor tweaks. 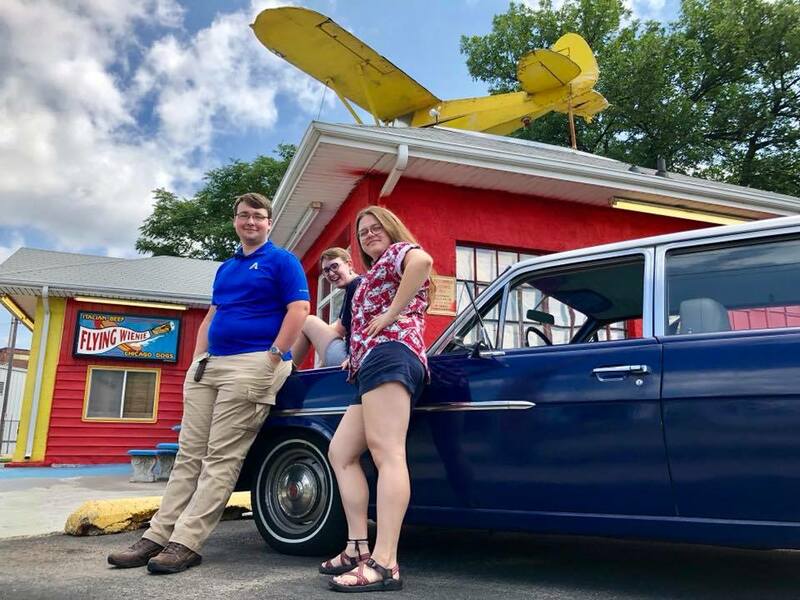 When Erick headed off to college in Arlington, Texas the summer of 2018, he road-tripped down old Route 66 with his sister, his girlfriend, and his dad. In January 2019, Erick and Anna road-tripped in Rhonda from Arlington to San Diego, up the California coast to San Franciso, over the Rockies to Denver, Colorado, and back to Arlington – almost 5000 miles in 15 days. 2005 Subaru Outback (“Reuben”) – The Silver Sleeper didn’t work out. One day I was taking a different route to work and passed the La Crosse Subaru dealer. They had a couple of used Outbacks parked on the corner with attractive prices. 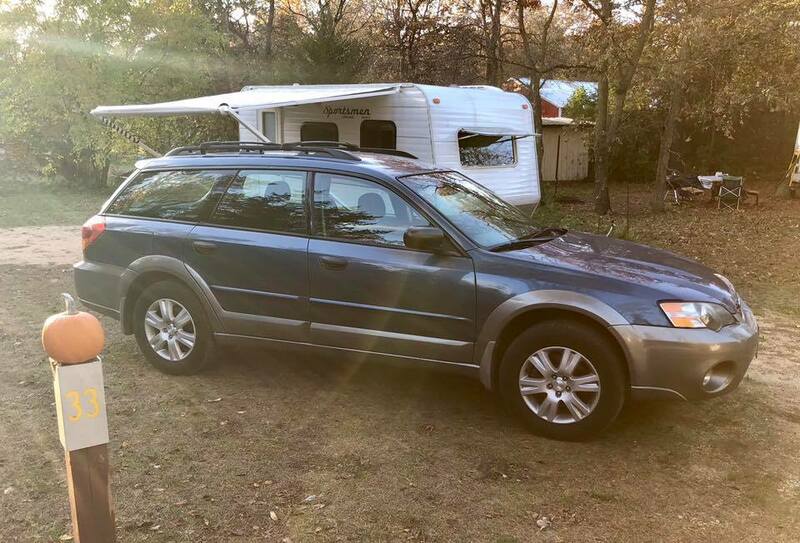 The one I really wanted sold too fast, but this nice blue Outback combined a manual transmission, enough capacity to tow our trailer, and a wagon body. The dealership gave us a generous $3,000 trade-in on the Odyssey. Reuben the Subaru is solidly built by Fuji Heavy Industries. I would describe it as truck-like: it feels tall and heavy and not very fast, but it also feels strong. Amazingly the little 2.5-liter pancake four hauls our 14′ KZ trailer well, aided by the fact I can manually downshift at will for more power. When not towing, the Subaru gets mileage in the mid-to-upper 20s. My first Subaru, and I am impressed. 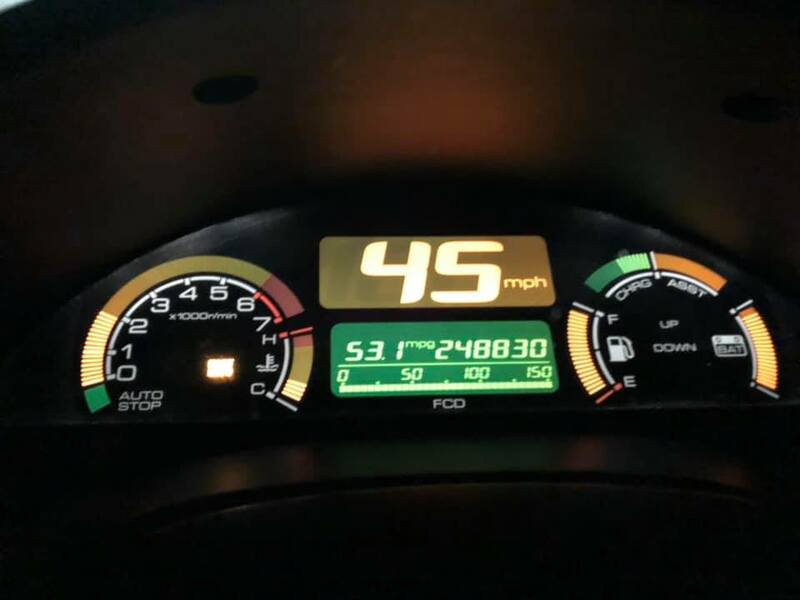 2002 Honda Insight (“Igor”) – This was an unexpected purchase. 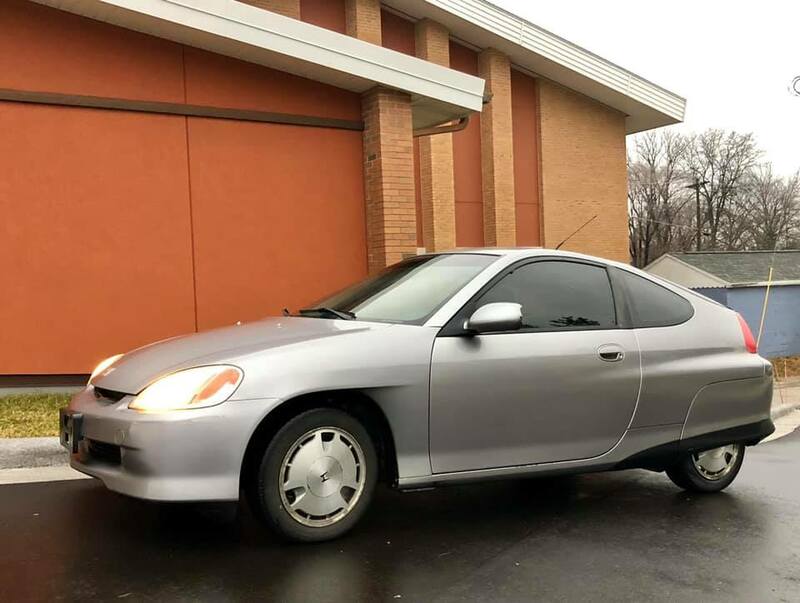 I was driving home from church the first Sunday in 2019 and saw this Honda Insight parked by a car stereo shop with a for sale sign. I’ve always thought Insights looked like interesting cars, so I stopped to check it out. “$500, runs and drives,” said the sign. Two hours later it was mine. The stereo shop had installed a $250 radio, so that’s half my money right there! The Honda Insight was the first hybrid for sale in the US, beating the Prius by several months in 2000. Honda designed and built the Insight with one purpose: this is a fuel economy supercar. The Insight was built in small quantities alongside the aluminum NSX supercar. It employs several advanced technologies: a complete aluminum body, advanced aerodynamics, special tires, a low-friction lightweight gas engine with lean burn mode, stop/start mode, and the hybrid gas/electric system. The EPA rated this 70mpg on the highway when new; I’ve seen 66mpg tops so far in mild winter driving. “Igor” has almost 250,000 miles and looks and drives well; lifetime fuel economy is 53.1mpg. It has a typical Insight problem with the transmission synchros on 1st and 2nd gear, so I get to practice my Crosley double-clutching. The “integrated motor assist” (IMA) battery is weak, but there are tricks for reconditioning these. Best $500 car I’ve ever owned. 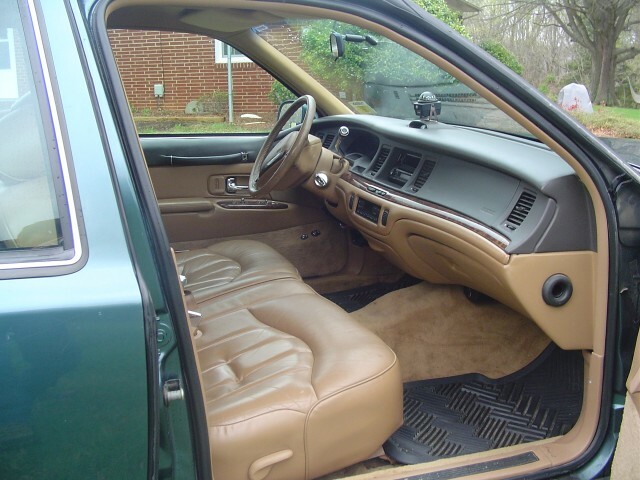 With only two seats, and being super-low to the ground, I joke that this is the car you own after the kids leave for college but before you have your hip replaced. It is remarkably small.